With 4.4 speed, Wisconsin running back Melvin Gordon not only has been running away from Big Ten defenses this season, but also running for a record that has stood for over two decades. Gordon, who is on the regional cover of this week's Sports Illustrated, is well within reach of Barry Sanders' FBS record for rushing yards in a single season with two games remaining, starting with Saturday’s against Ohio State for the Big Ten Championship. In 12 games this season, Gordon leads the nation in rushing and scoring, with 2,260 rushing yards (on eight yards a carry) and 29 total scores. Sanders ran for 2,628 yards and had 39 total touchdowns in 11 regular season games during his 1988 Heisman Trophy-winning campaign at Oklahoma State, and ran for 222 on the ground in a bowl game victory against Wyoming that the NCAA doesn’t recognize. Gordon held the single game rushing record of 408 yards in a sublime performance against Nebraska for one week before it was broken by Oklahoma’s Samaje Perine, who ran for 427 yards against Kansas. Gordon’s journey to stardom was slow, as he got limited playing time in his freshman and sophomore seasons, sitting behind Montee Ball and James White, and admitting that he was frustrated by the lack of playing time. Both Ball and White moved on, allowing Gordon to seize his opportunity, and he did just that by rushing for 1,609 yards in 2013. “Every running back that has started here had a great career and helped lead the team to success. They took the team to greater heights. I want to keep the bar high. That’s just how it is,” Gordon said. 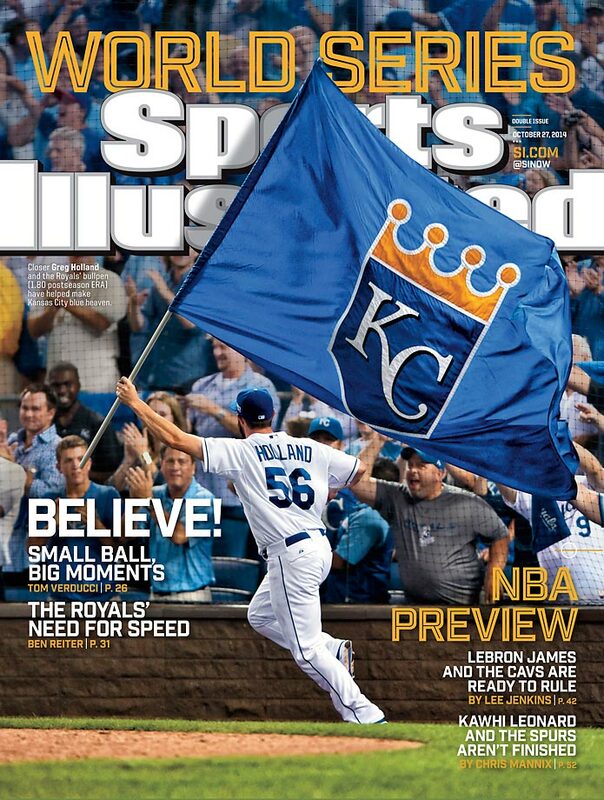 For more on Gordon, read Brian Hamilton's story in this week's Sports Illustrated (subscribe here). 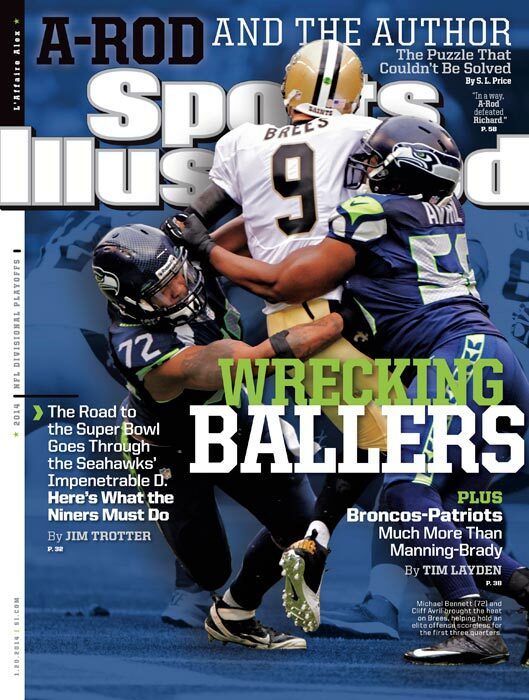 Also in this issue: features on the New Orleans Pelicans forward Anthony Davis, the vertically-challenged players of the NFL and MLB, and former UCLA basketball star Ed O'Bannon. Subscribers and newsstands in Wisconsin, South Dakota, North Dakota, Minnesota, Iowa, Michigan, Indiana, Illinois, Nebraska, Eastern Missouri will receive this issue. Not in the area to buy the regional issue? Buy single issues here. 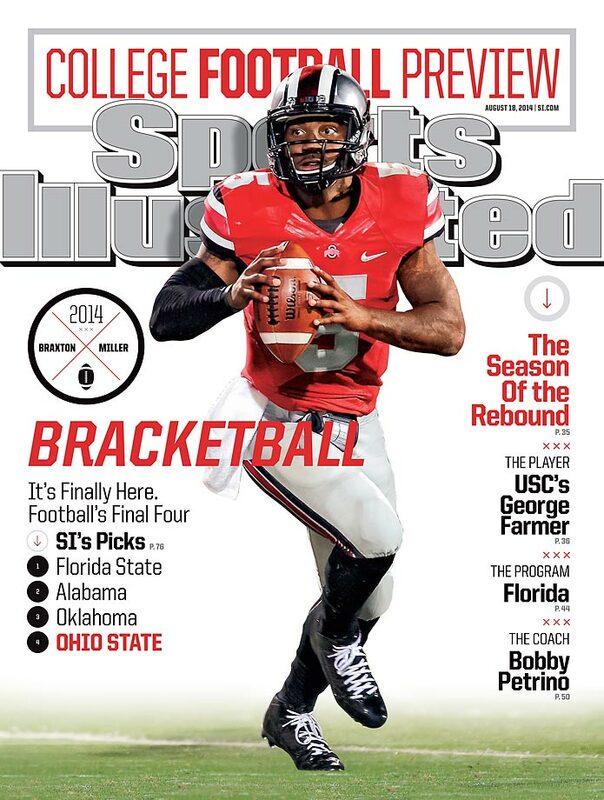 December 29, 2014 | The Buckeyes are down to their third-string quarterback for coach Urban Meyer, who is two victories away from claiming his third national title. *This is a double issue: Dec. 29, 2014 0 Jan. 5, 2015. 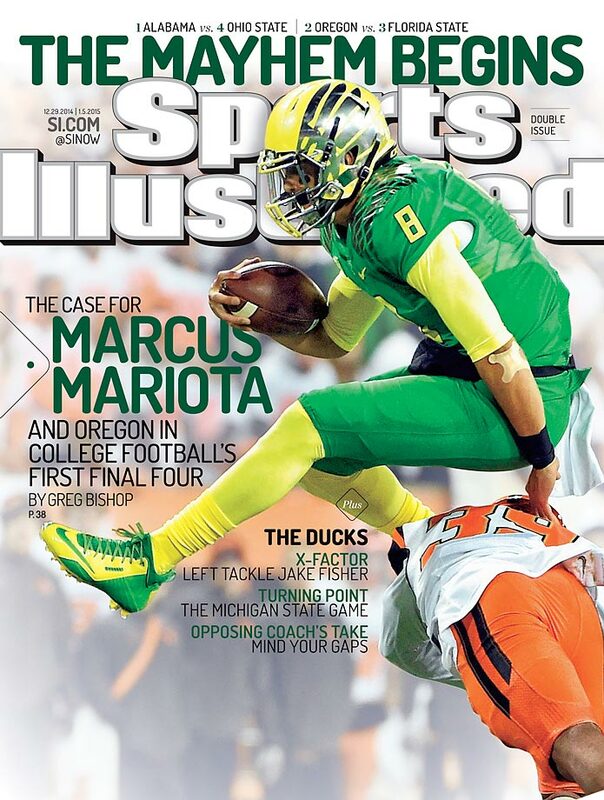 December 29, 2014 | Oregon’s high-powered offense led by Heisman Trophy winner Marcus Mariota looks to lead the Ducks to their first national championship. December 29, 2014 | Florida State, winners of 29 straight games, are led last year’s Heisman winner Jameis Winston and a resiliency unmatched in college football. December 29, 2014 | The Crimson Tide are back in the title hunt, seeking their fourth national championship in the last six seasons. 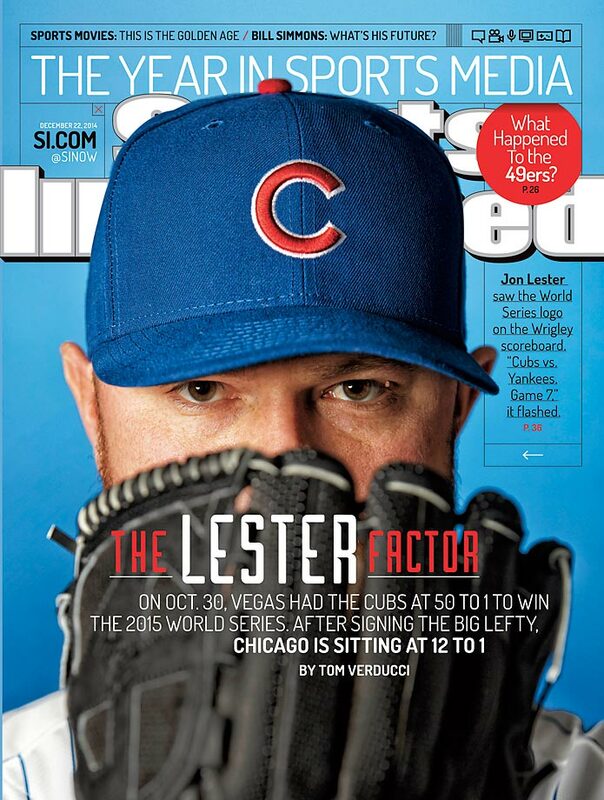 December 22, 2014 | Jon Lester’s arrival in Chicago, along with a six-year $155 million contract, has expectations high for the "lovable losers," who are now 12-1 favorites to win the 2015 World Series. December 22, 2014 | The San Francisco 49ers three-year NFC Championship game appearance run is coming to end and head coach Jim Harbaugh’s tenure with the team could soon be coming to an end as well. 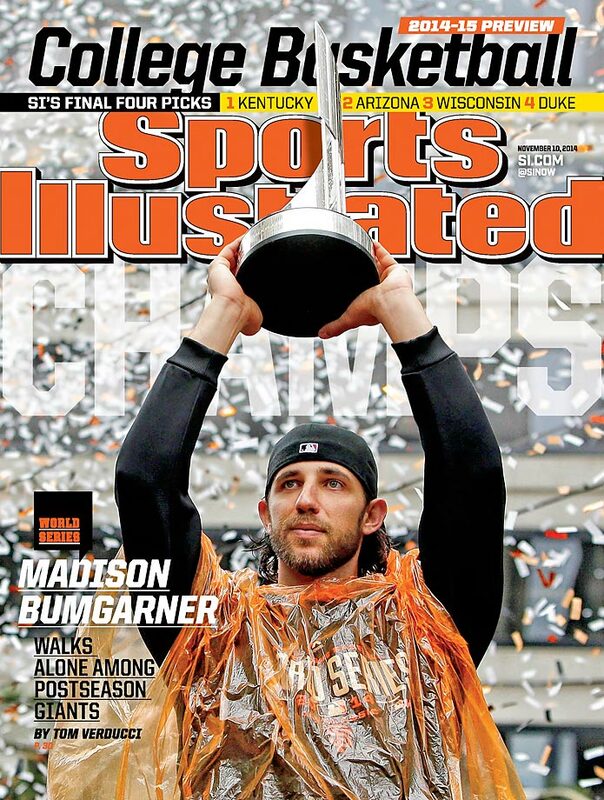 December 15, 2014 | San Francisco Giants pitcher Madison Bumgarner had a postseason for the ages, giving up only six earned runs while pitching a record 52 2/3 innings helping the Giants to their third World Series title in the past five seasons. 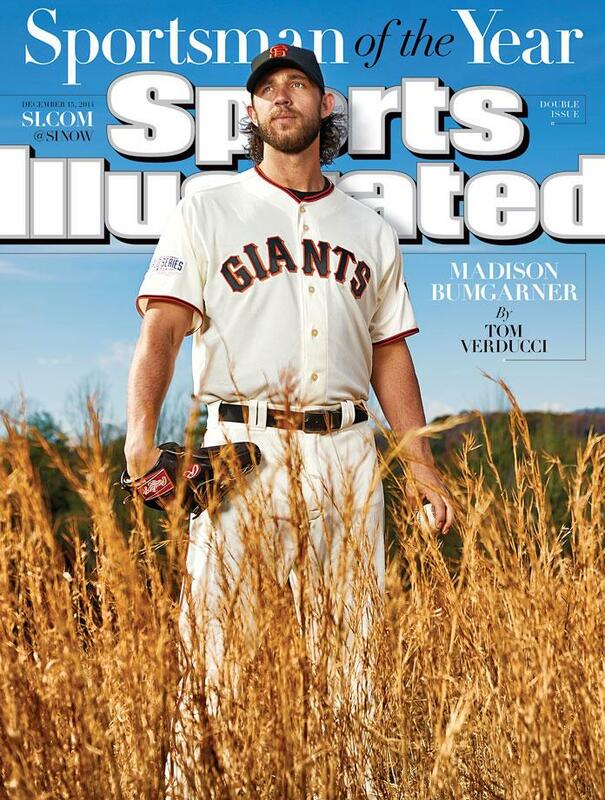 He is seventh MLB pitcher to be awarded Sports Illustrated’s Sportsman of the Year. 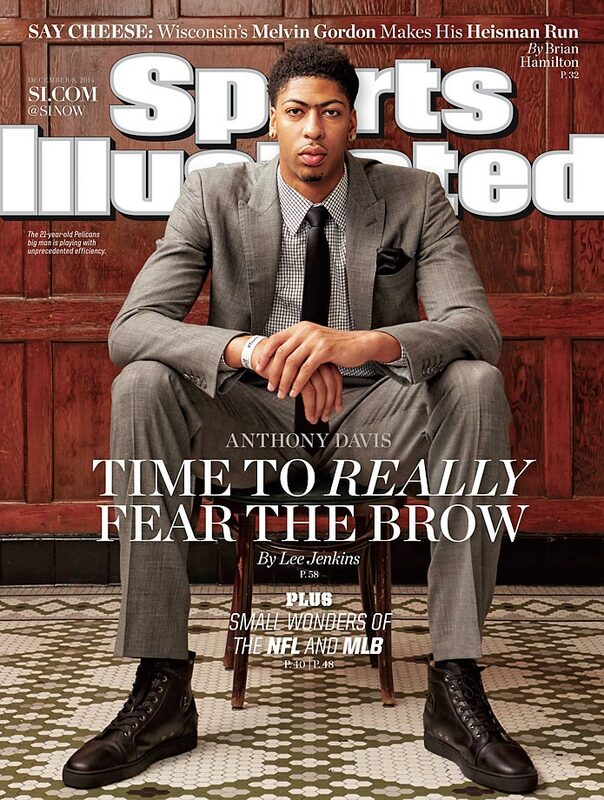 December 8, 2014 | The Pelicans do-it-all forward Anthony Davis is headed for superstardom, complete with an offensive game that’s hard to defend and a fearless defensive presence around the basket. 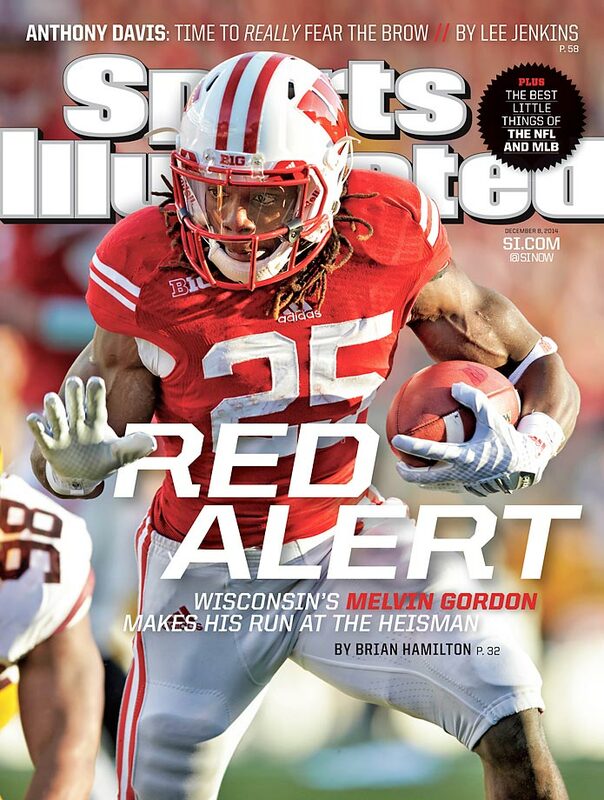 December 8, 2014 | Wisconsin’s record-setting running back Melvin Gordon has his sights on the FBS single-season rushing record and the Heisman Trophy. 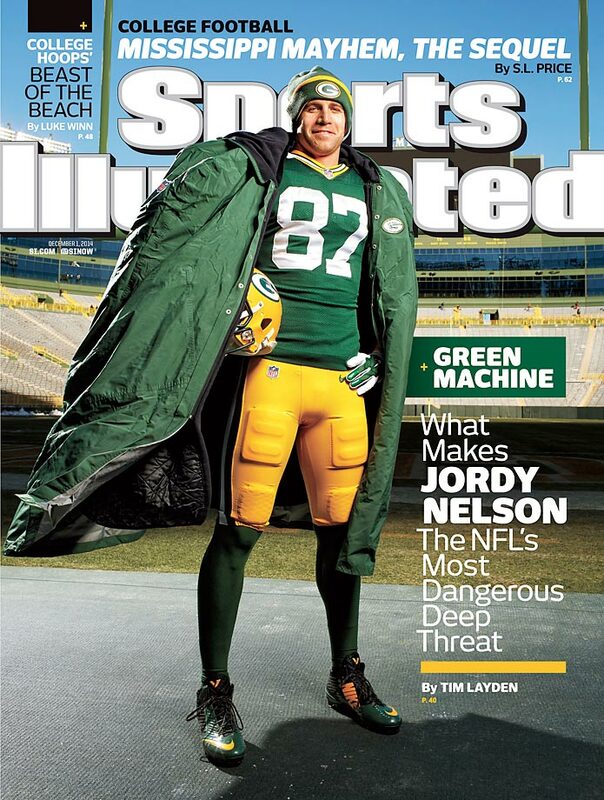 December 1, 2014 | Big, strong and fast, Jordy Nelson is perhaps the NFL's best deep threat and undoubtedly one of the league's best receivers, even though he hasn't always been recognized as such. 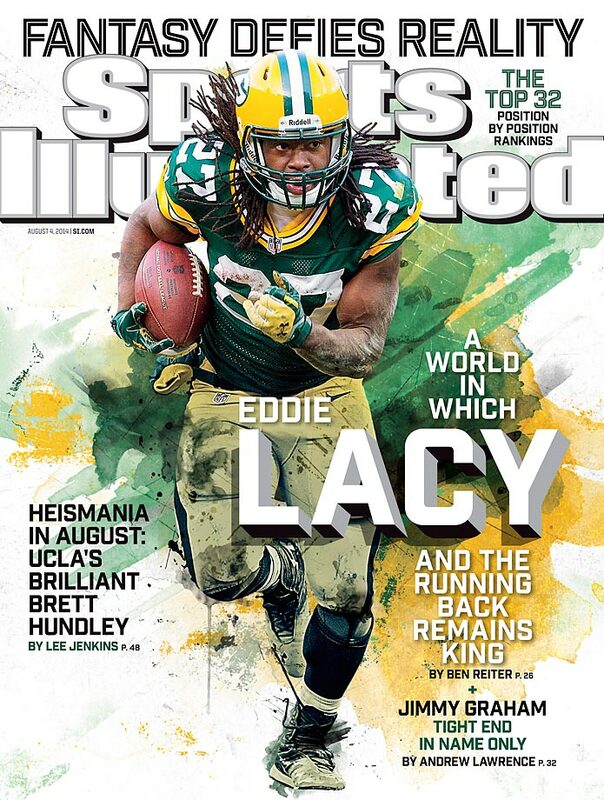 On pace to finish atop the franchise's all-time leaders in receptions and receiving yards, Nelson, who's on this week's SI cover, is a solid bet to make his first Pro Bowl this season, and he's helped the Packers (8-3) become a Super Bowl contender once again. 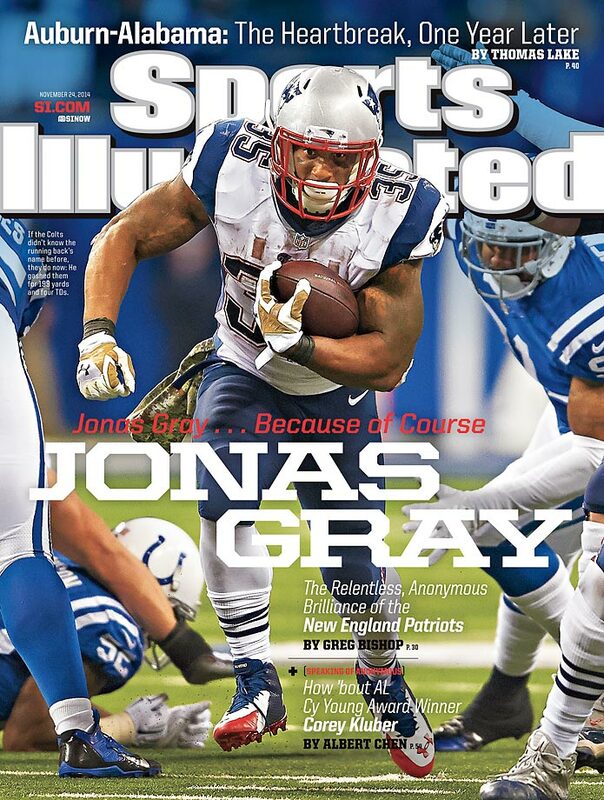 November 24, 2014 | The Patriots may have a found another diamond in the rough, this time with undrafted running back Jonas Gray, who ran for 199 yards and 4 touchdowns in a Monday night victory over the Colts. November 24, 2014 | One of the NHL’s best defensemen, P.K. 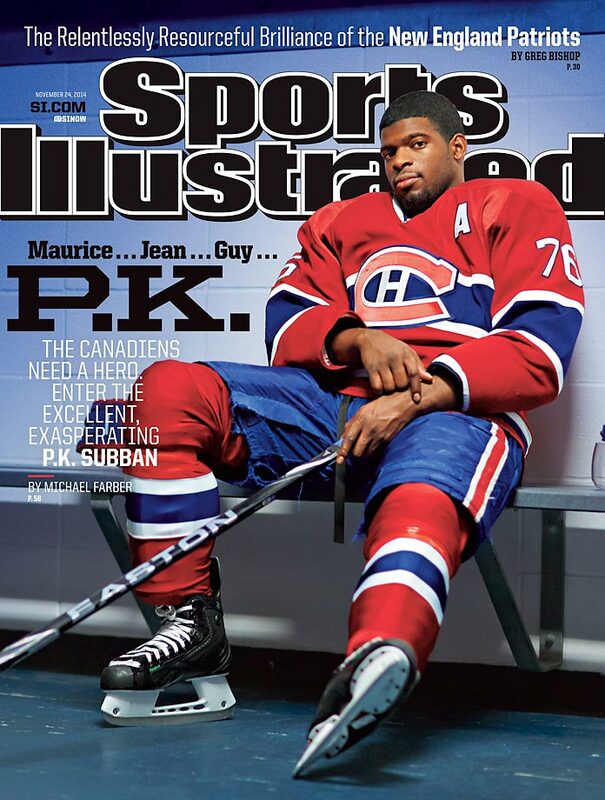 Subban of the Canadiens. hopes to help bring the Stanley Cup to Montreal for the first time since 1993. 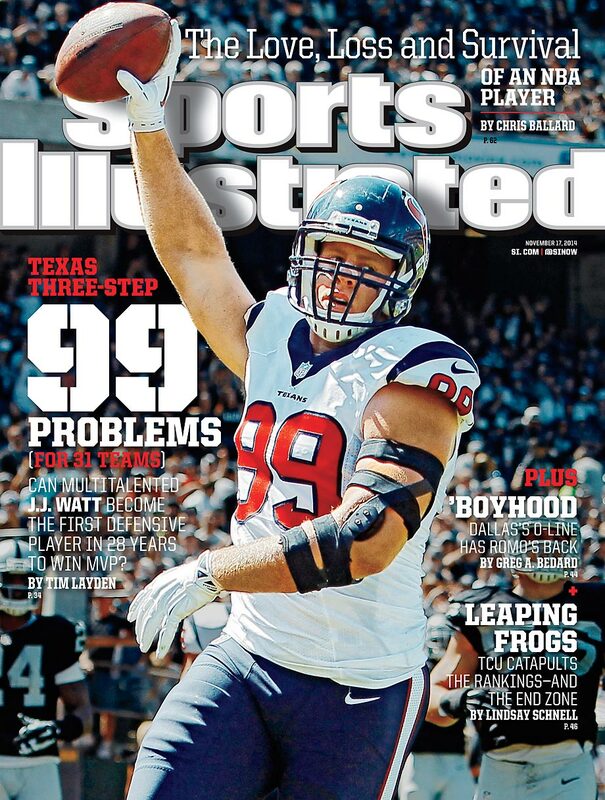 November 17, 2014 | The NFL’s most dominate defensive player, Texans All-Pro J.J. Watt, wants to focus on nothing else but the next play and piling up victories. 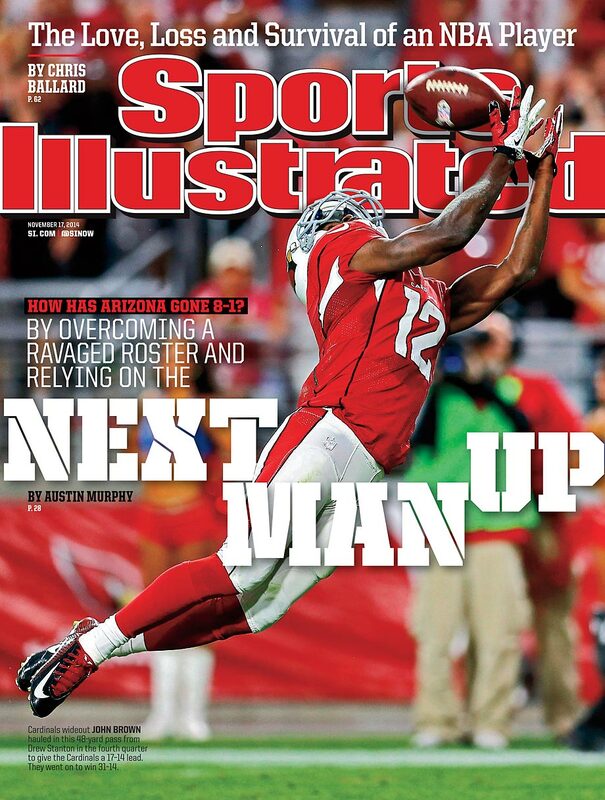 November 17, 2014 | The Arizona Cardinals are sporting the league’s best record, despite injuries across the board, including to their starting quarterback. 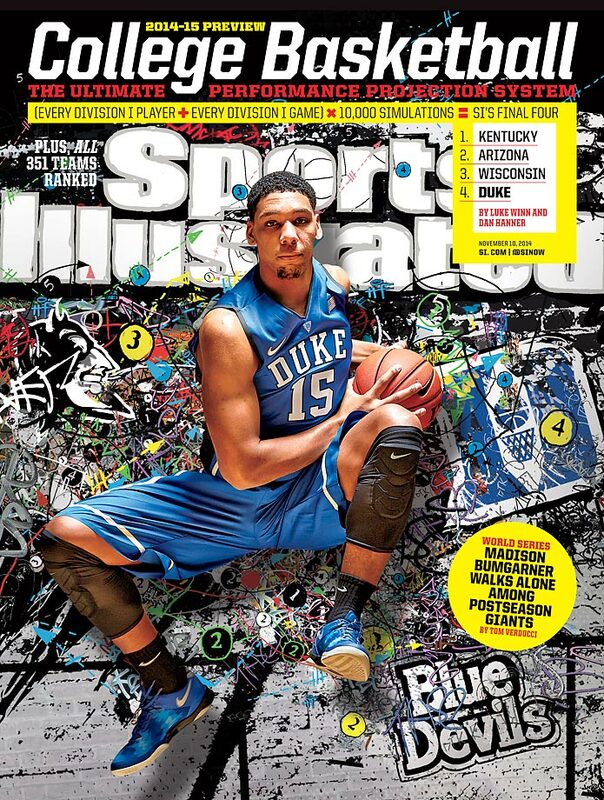 November 10, 2014 | Freshman Jahlil Okafor and the Blue Devils have the nation’s No. 1 recruit class and will look to avoid last season’s disappointment after losing in the first round of the NCAA Tournament to Mercer. 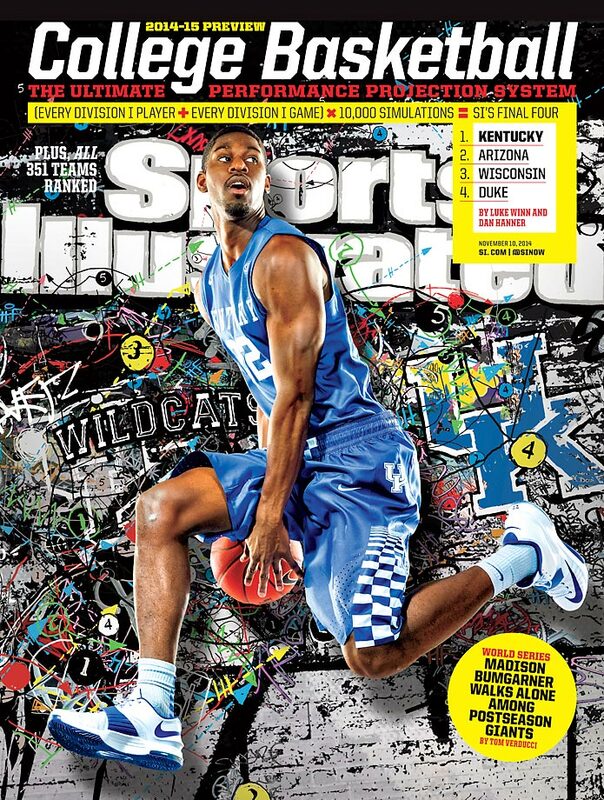 November 10, 2014 | With nine talented McDonald's All-Americans on the roster and sky-high expectations, preseason No. 1 Kentucky leads a pack of teams looking to reach the Final Four in Indianapolis. 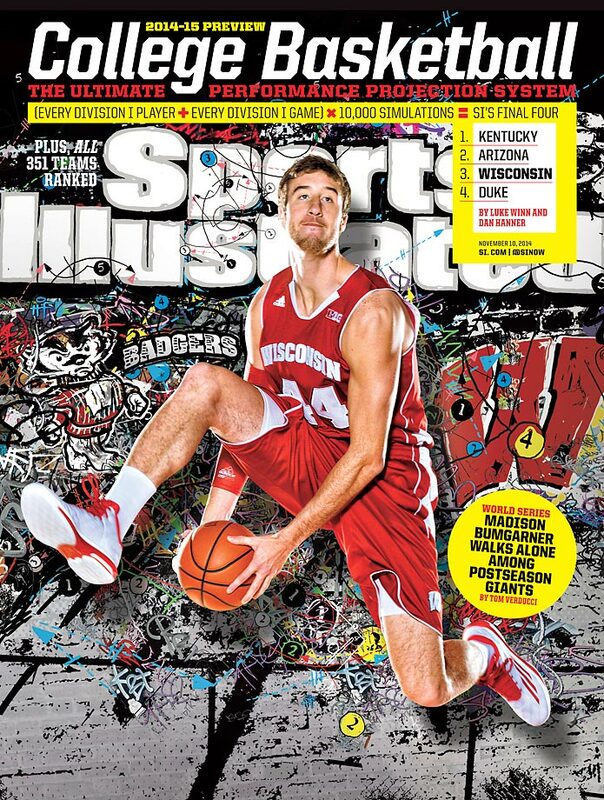 November 10, 2014 | Paced by the nation’s most efficient offense, Wisconsin and Wooden award candidate Frank Kaminsky look to dethrone Michigan State as the Big Ten’s top team. 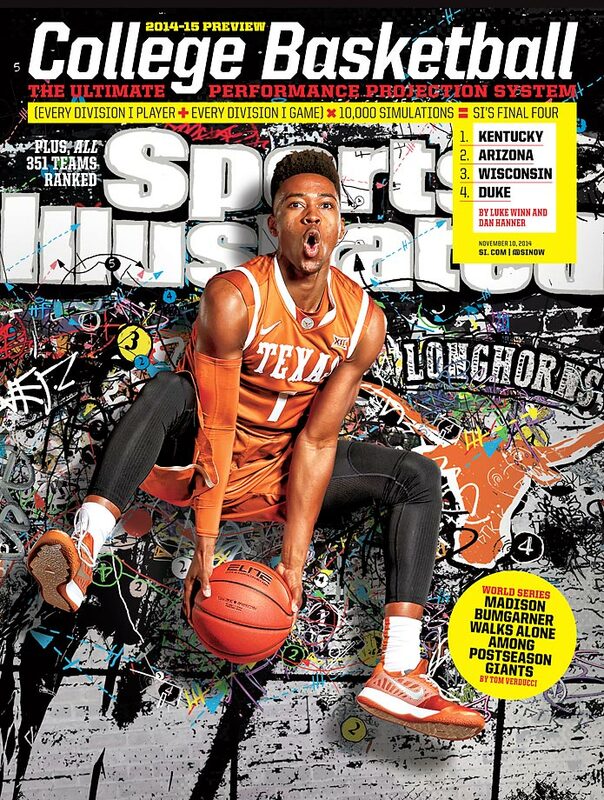 November 10, 2014 | With five returning starters plus freshman Myles Turner, Texas may just have enough to end Kansas and its 10-year stranglehold on the Big 12. 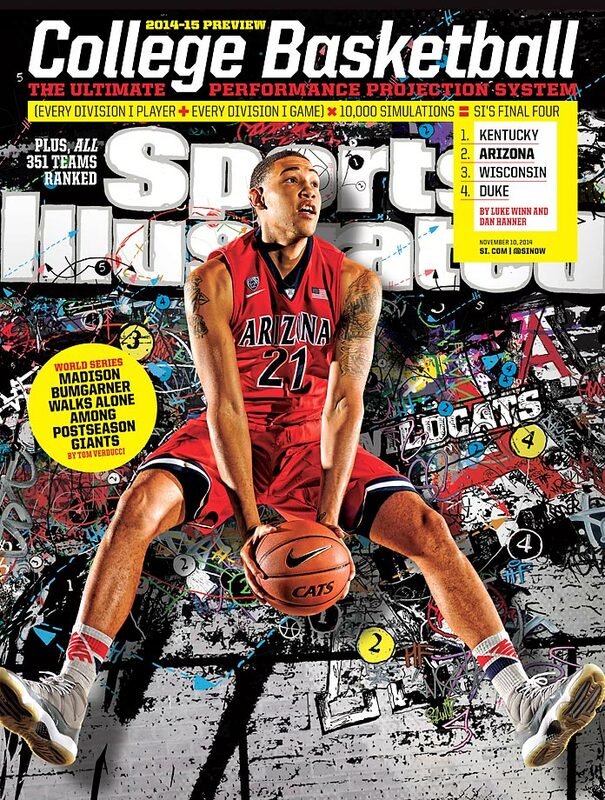 November 10, 2014 | The Wildcats are paced by a ferocious defense and another stellar recruiting class but can they break through to get to the Final Four? 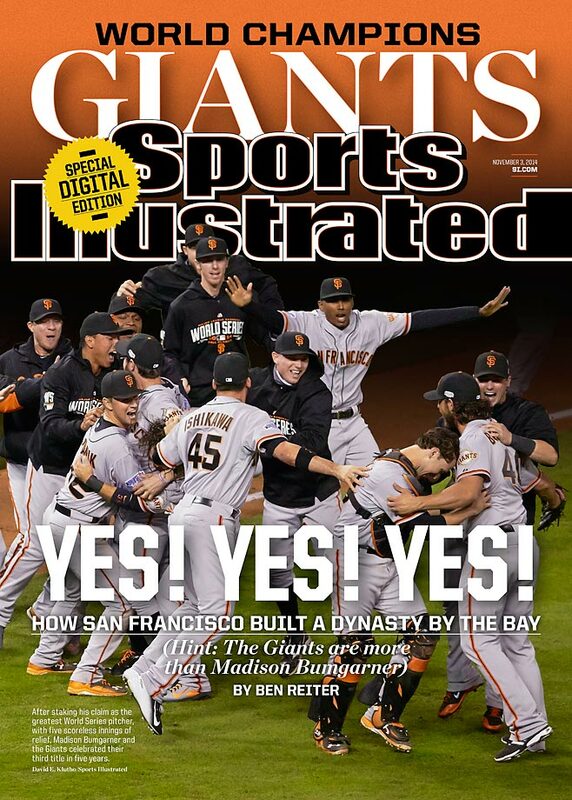 November 10, 2014 | San Francisco’s third World Series victory in five seasons can be credited by a dominate pitching performance by Madison Bumgarner and a shrewd front office that is built to win. 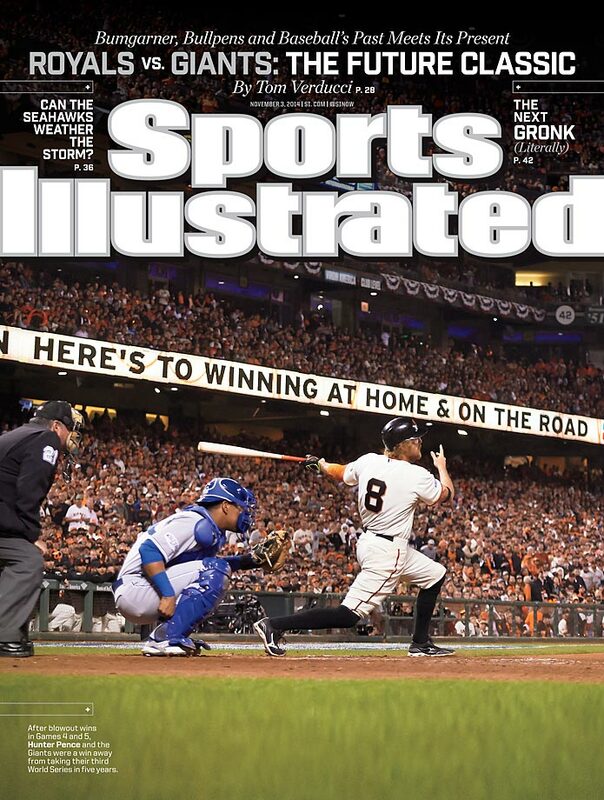 November 3, 2014 | SI's special digital edition on the heels of the San Francisco Giants winning Game 7 of the World Series over the Kansas City Royals. November 3, 2014 | As the World Series comes to a close, the Giants and Royals try to play the kind of baseball that got them this far: playing stingy defense to go along with outstanding pitching. 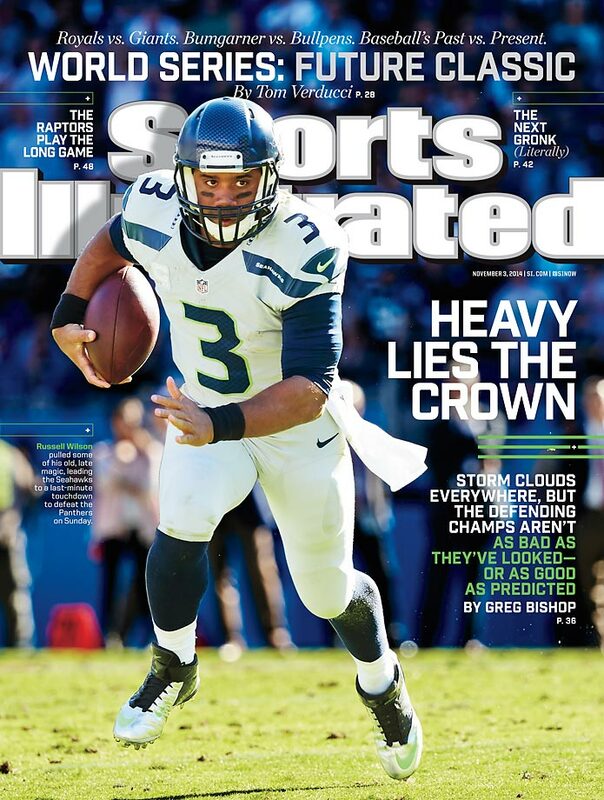 November 3, 2014 | Admit reports of locker room turmoil, the Super Bowl Champion Seattle Seahawks win over the Panthers on Sunday have quieted their critics…..for now. October 27, 2014 | The Cleveland Cavaliers squarely have a target on their backs after LeBron James and Kevin Love joined the team. But does that make them the favorites for the championship? October 27, 2014 | The World Series between the Royals and Giants may lack power hitting prowess, but will feature plenty of running, timely hitting and outstanding pitching. 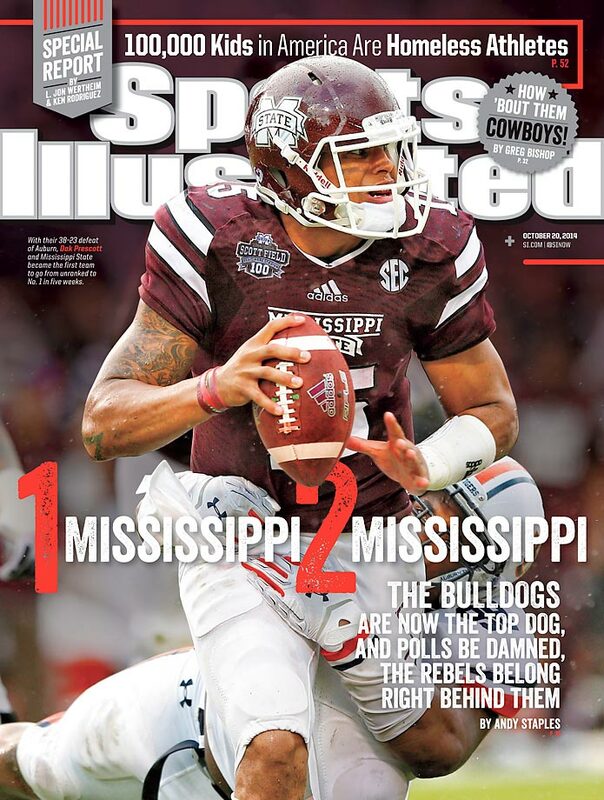 October 20, 2014 | Mississippi State quarterback and Heisman candidate Dak Prescott has the Bulldogs sitting on top of the polls after a shocking run through some of the top teams in the SEC. 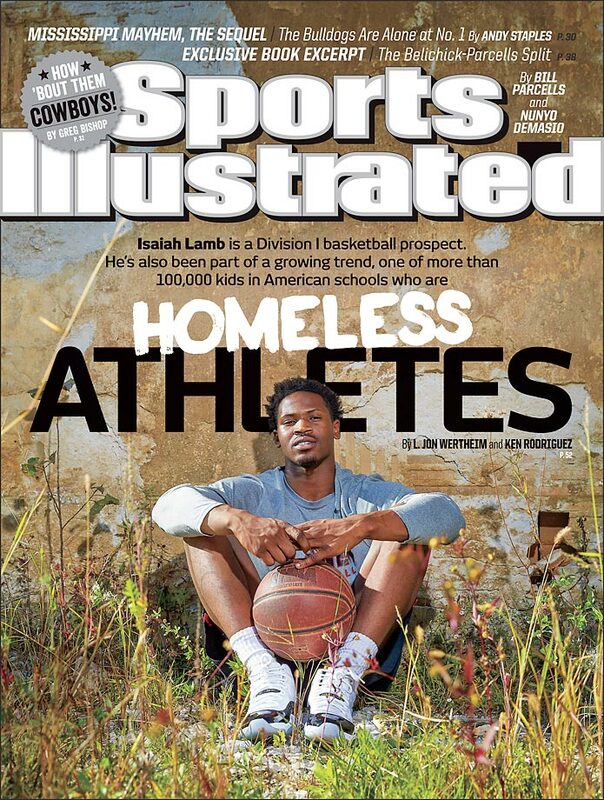 October 20, 2014 | There are thousands of homeless athletes around the United States and an SI investigation found that most of them thrive and survive with the help of sports. 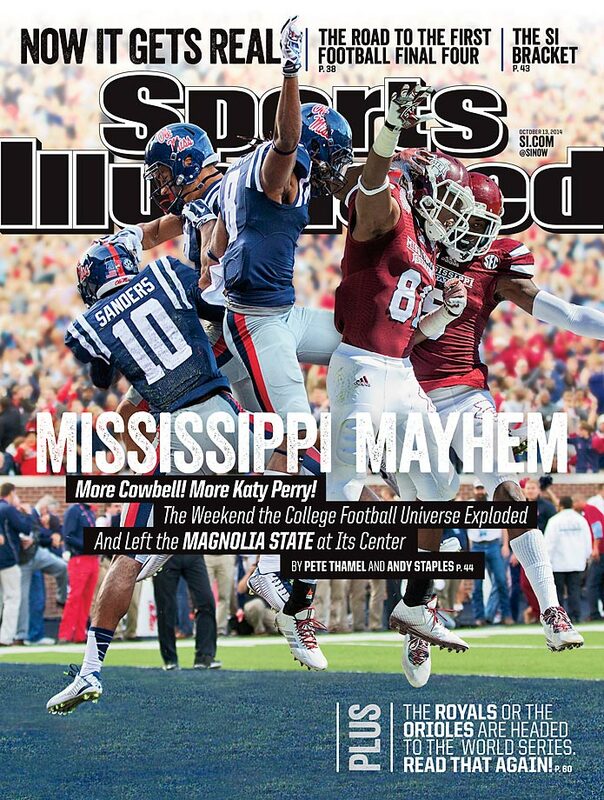 October 13, 2014 | The Magnolia State was front and center of the college football universe last Saturday, with Ole Miss and Mississippi State scoring historic victories and throwing the college football playoff into complete chaos. 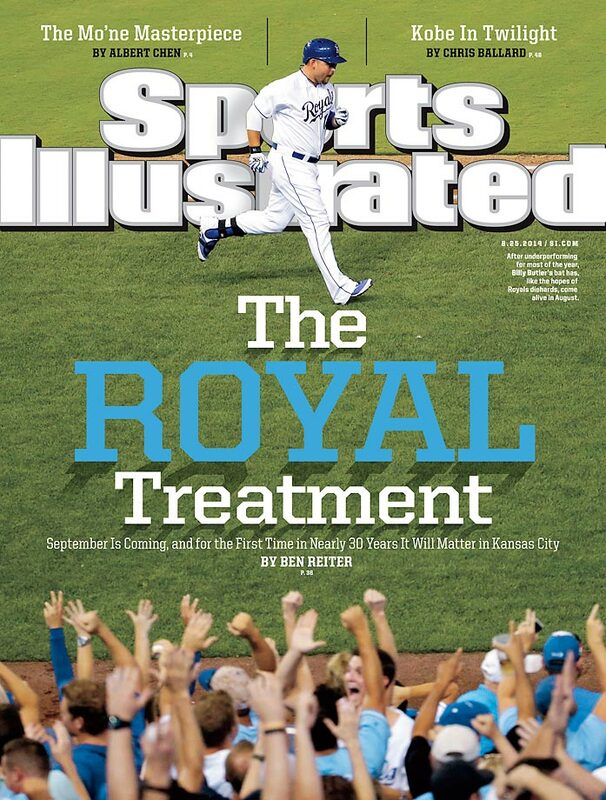 October 13, 2014 | Lacking power, but plenty of speed, the Kansas City Royals are four victories from their first World Series appearance since 1985. 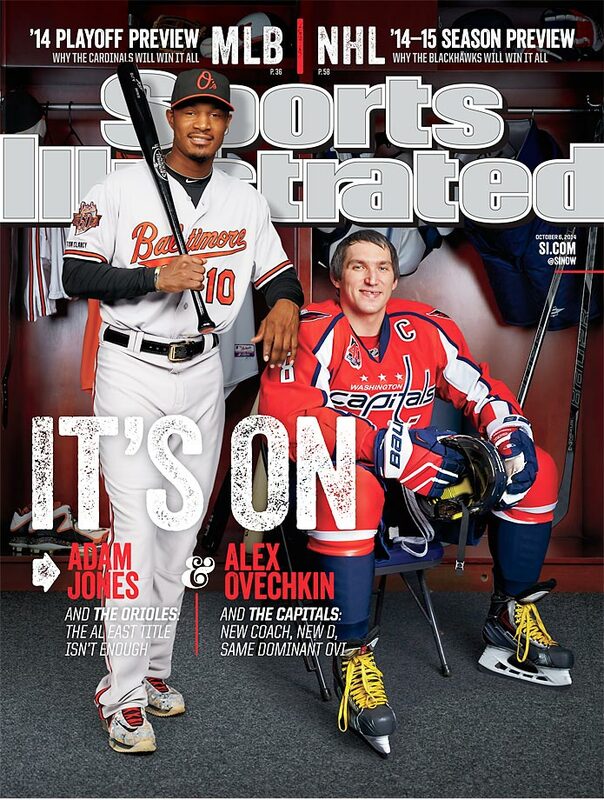 October 6, 2014 | Hoping to avoid early playoff exits, fans of the Beltway teams pins its championship hopes on Orioles outfielder Adam Jones and Capitals center Alex Ovechkin. 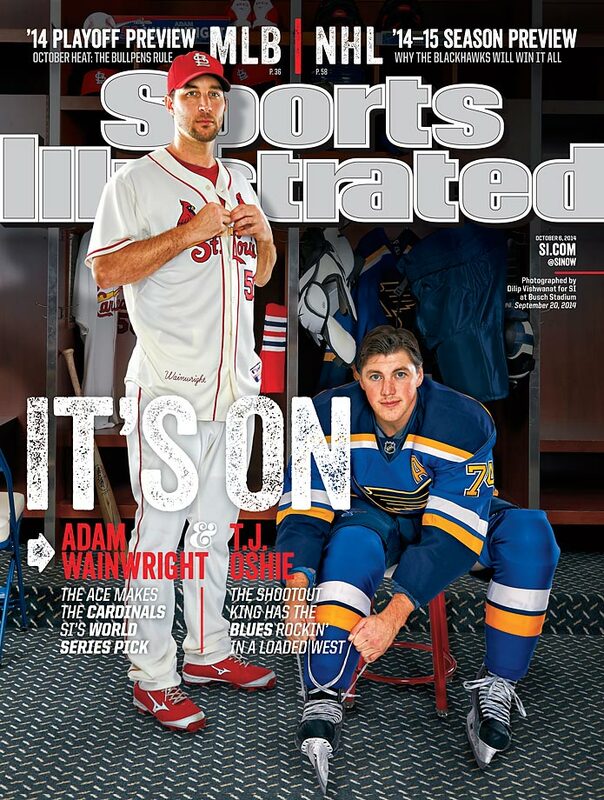 October 6, 2014 | The St. Louis Cardinals and St. Louis Blues, led by Adam Wainwright and T. J Oshie, look to get past last year’s disappointing playoff exits. 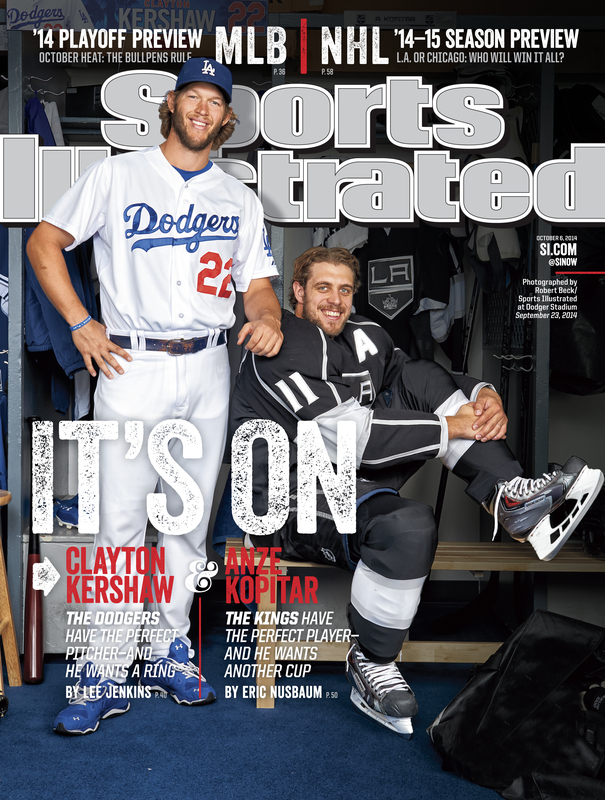 October 6, 2014 | Although Los Angeles has no NFL team, Dodgers ace Clayton Kershaw and Kings forward Anze Kopitar are making sure that fans in the area don't miss America's most popular sport. September 29, 2014 | As New York Yankees shortshop Derek Jeter closes the book on a 20-year career, he reflects on what has changed in the time that he has been in pinstripes. 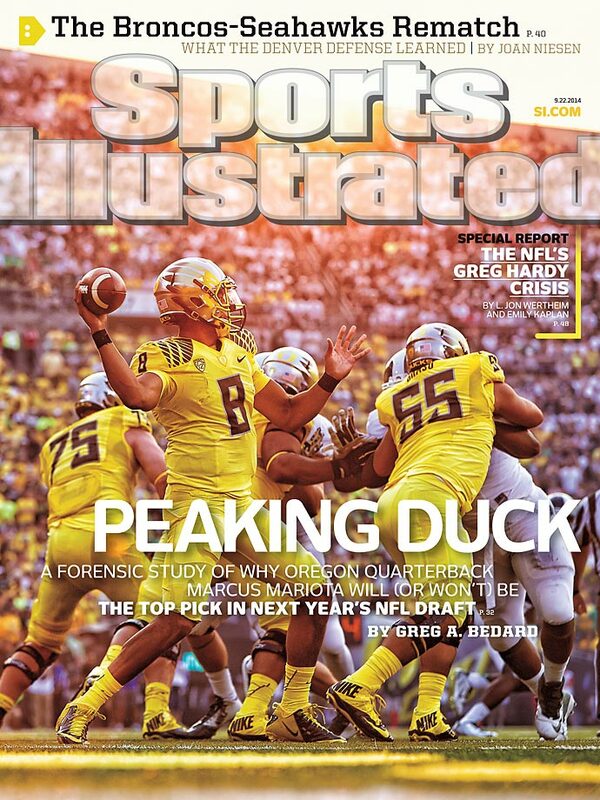 September 22, 2014 | Oregon quarterback Marcus Mariota is almost certainly going to be a first-round NFL draft pick next year, but why are scouts so high on him? 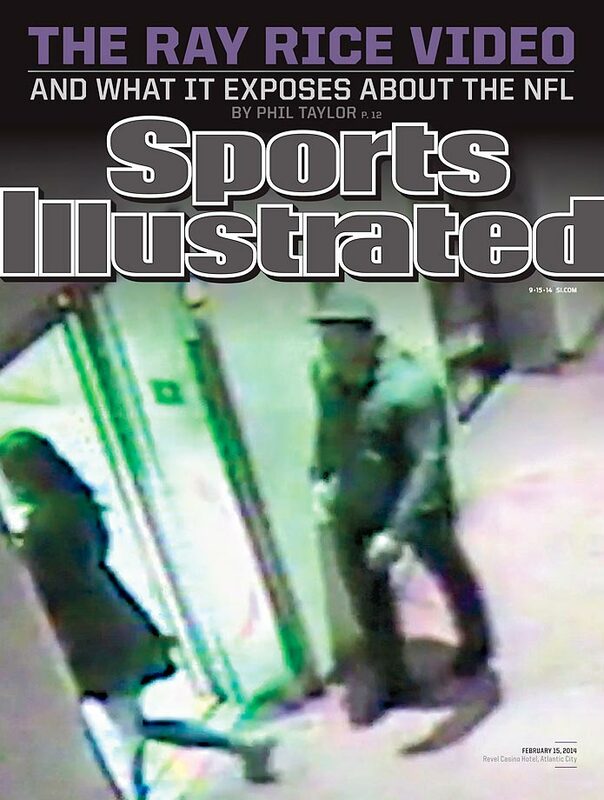 September 15, 2014 | The focus is now on the National Football League and how they handled the situation involving former Baltimore Ravens running back Ray Rice. 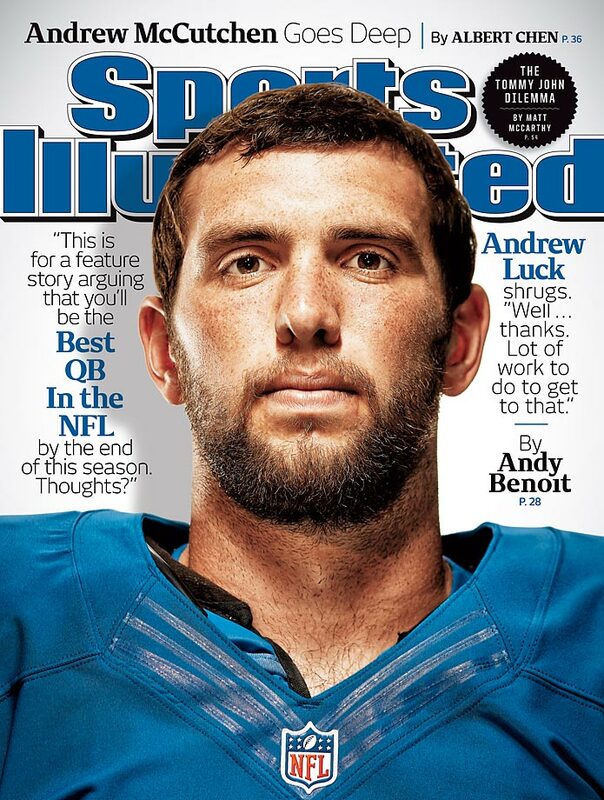 September 8, 2014 | The case can be made that Indianapolis Colts quarterback Andrew Luck is already one of the NFL’s best at his position. Just don’t tell him that. 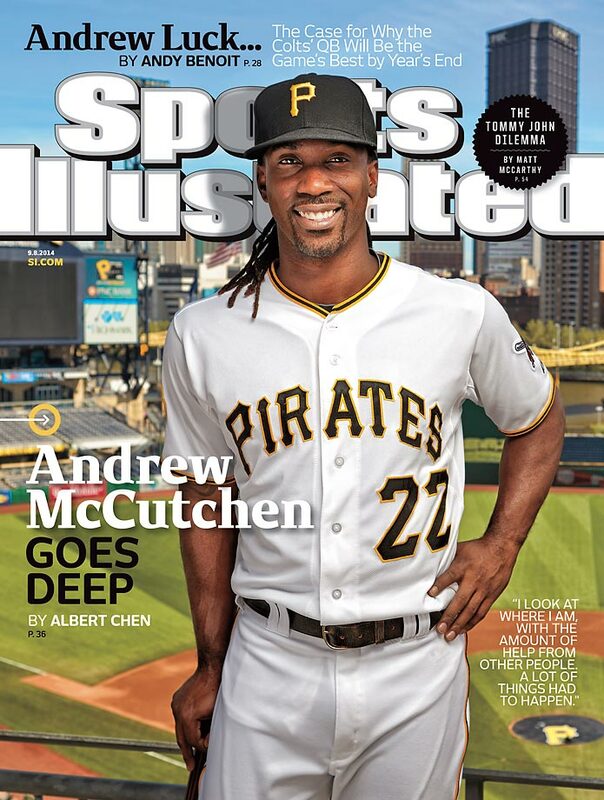 September 8, 2014 | The National League’s reigning MVP Andrew McCutchen is leading the Pirates back to another possible playoff berth. 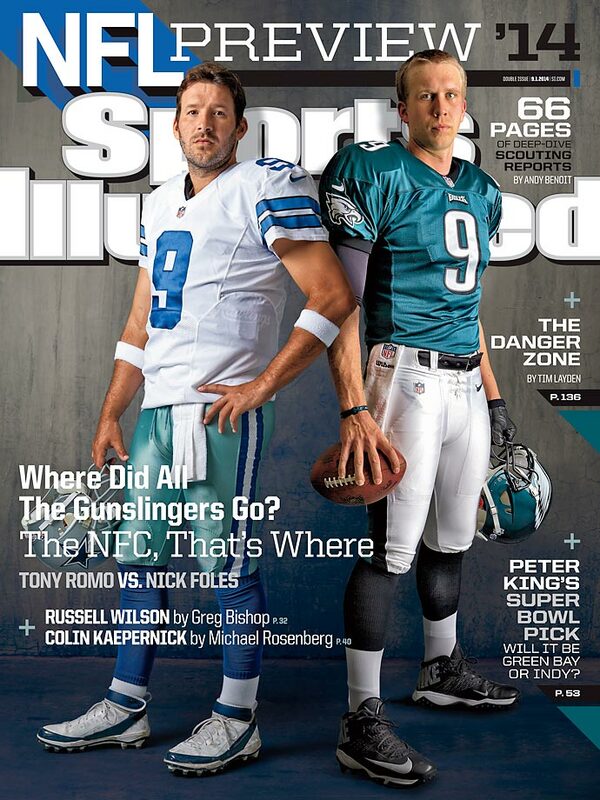 September 1, 2014 | The NFC East features two of the most talented signal callers in the league in Tony Romo and Nick Foles. But if neither team’s defense shows up, both might be sitting at home watching the playoffs this season. 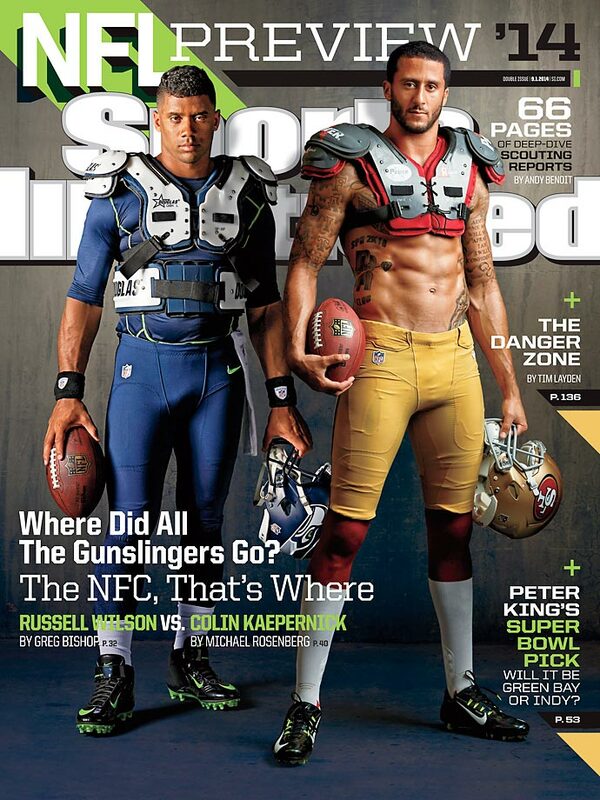 September 1, 2014 | The NFC West title goes through Seattle, but the 49ers and quarterback Colin Kaepernick will try to reach the NFC Championship for a fourth straight year. September 1, 2014 | Atlanta and New Orleans both have enough offensive firepower to outscore anyone. And outscoring, and not stopping opponents might be enough to win the NFC South. 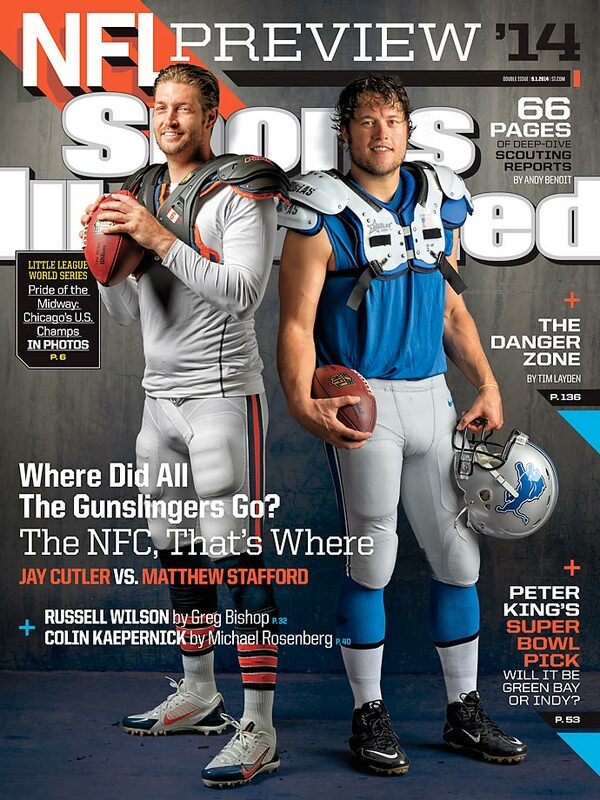 September 1, 2014 | Two quarterbacks, Chicago’s Jay Cutler and Detroit’s Matthew Stafford, look to detrone the Packers in the NFC North and lead their teams to a division title. 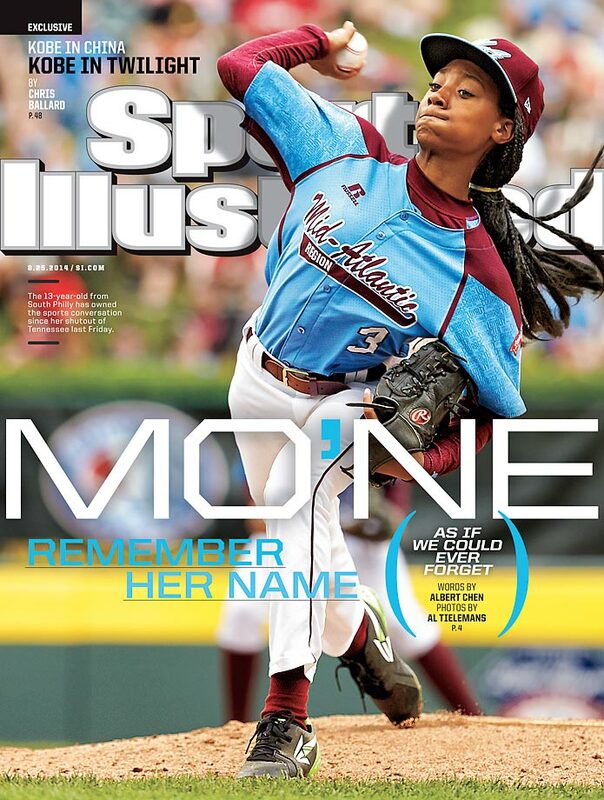 August 25, 2014 | Mo'ne Davis, a 5-foot-4 inch, 111-pound eighth grader is not only taking the Little League World Series by storm, but the rest of the nation is starting to take notice as well. 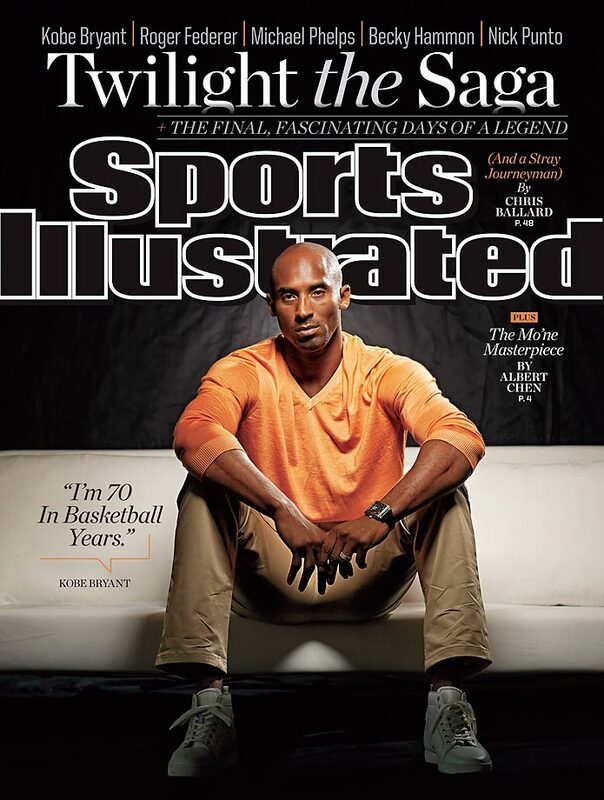 August 25, 2014 | Lakers star Kobe Bryant knows the end of his career is near, but is doing to things to prolong a Hall of Fame legacy and to set up for his future. August 25, 2014 | After nearly 30 years of missing the playoffs, the AL Central leading Kansas City Royals are on the brink of joining the postseason party. 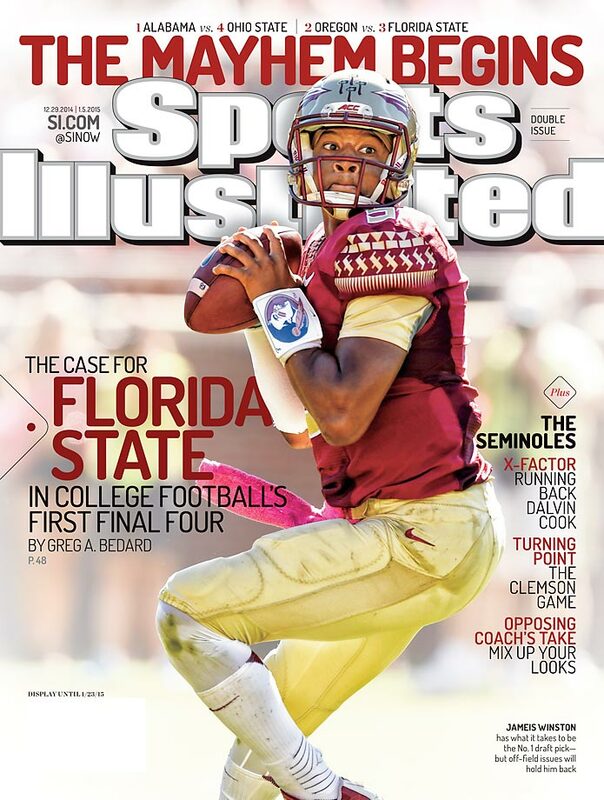 August 18, 2014 | Heisman Trophy winner Jameis Winston seeks to become the first back-to-back winner in almost 40 years. The Seminoles are also big favorites to repeat as national champions. 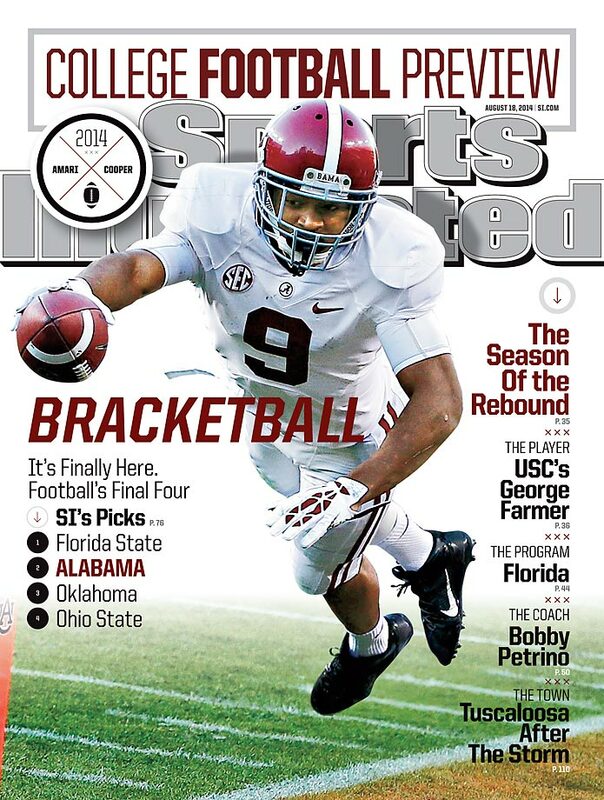 August 18, 2014 | Alabama wide receiver Amari Cooper hopes to bounce back from a disappointing 2013 season, by leading the Crimson Tide back to the title game. 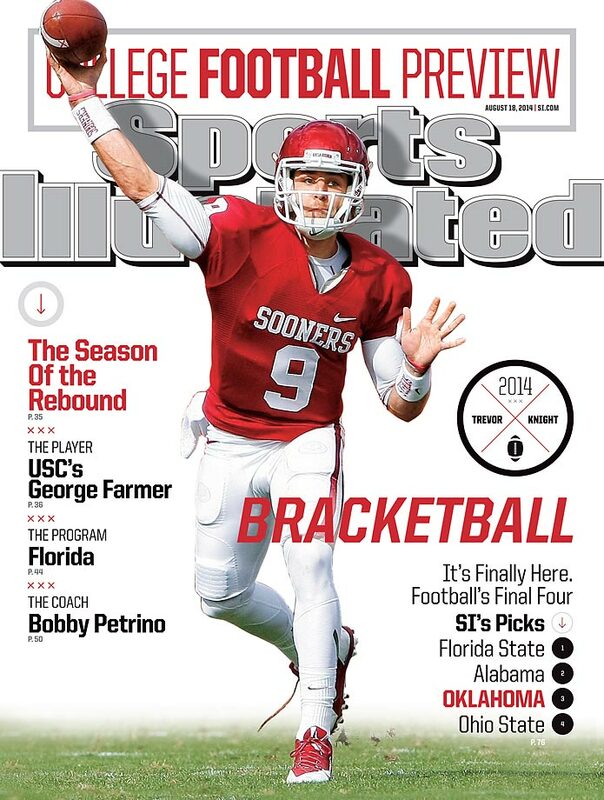 August 18, 2014 | Oklahoma quarterback Trevor Knight looks for a repeat performance after bursting on the scene by shredding Alabama’s defense in the Sugar Bowl. 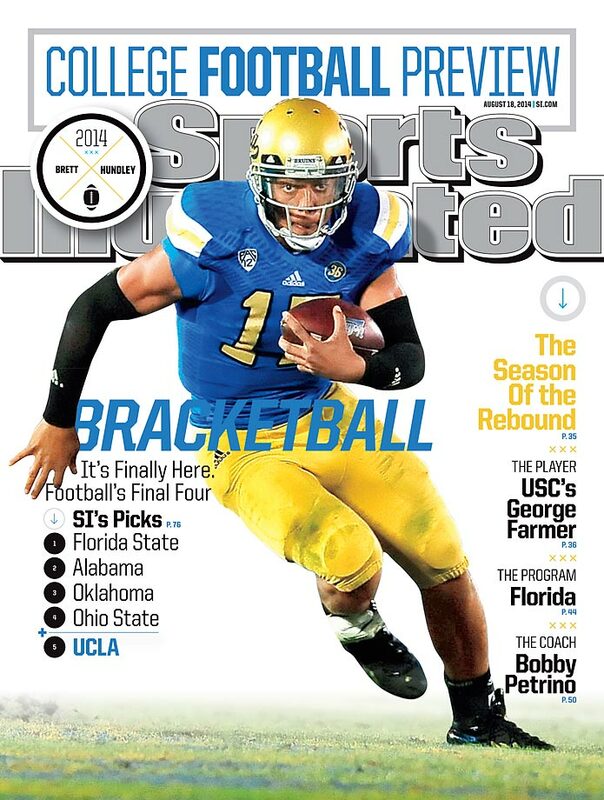 August 18, 2014 | UCLA quarterback Brett Hundley passed up NFL riches to try to lead UCLA back into the national spotlight. August 18, 2014 | Ohio State quarterback Braxton Miller looks for a better end of the season, after two consecutive losses knocked the Buckeyes out of the championship picture. 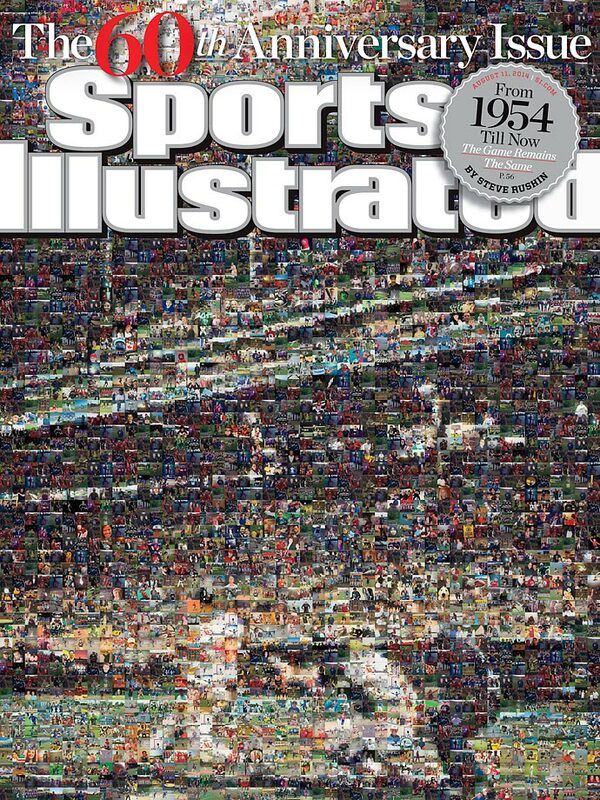 August 11, 2014 | With over 3,000 covers spanning the last seven decades, Sports Illustrated's 60th anniversary issue pays tribute to the readers as the cover features a mosaic with thousands of reader submitted photos. 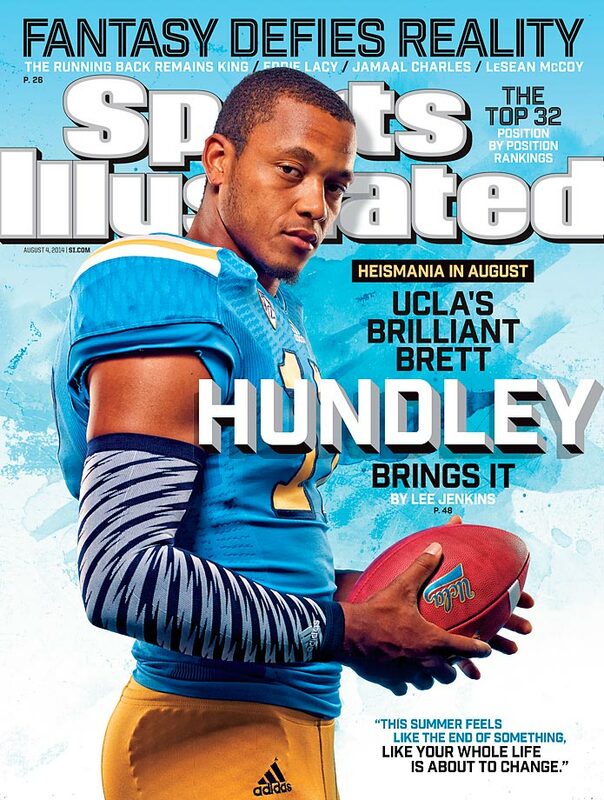 August 4, 2014 | UCLA quarterback and Heisman Trophy hopeful Brett Hundley passed up NFL riches to try to lead the Bruins back to national prominence. 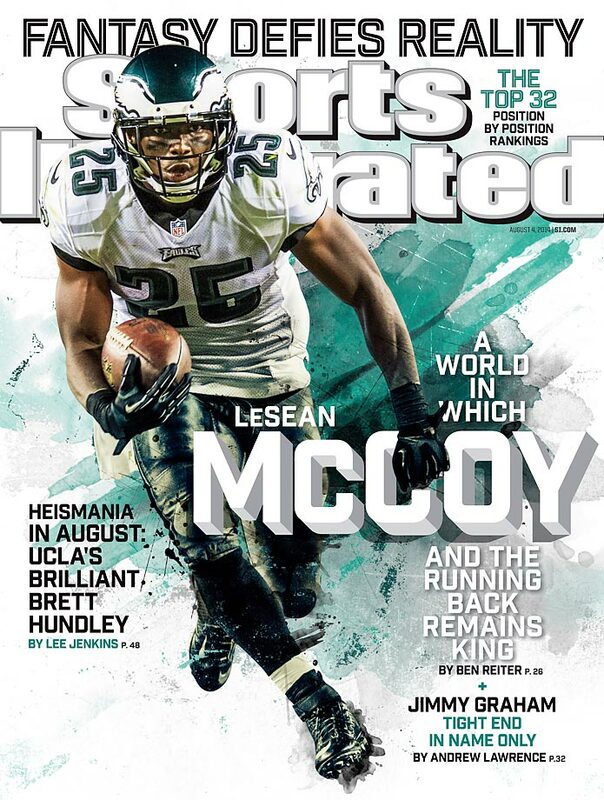 August 4, 2014 | The NFL’s leading rusher in 2013, LeSean McCoy credits offseason workouts for the reason he has been able to stay healthy. 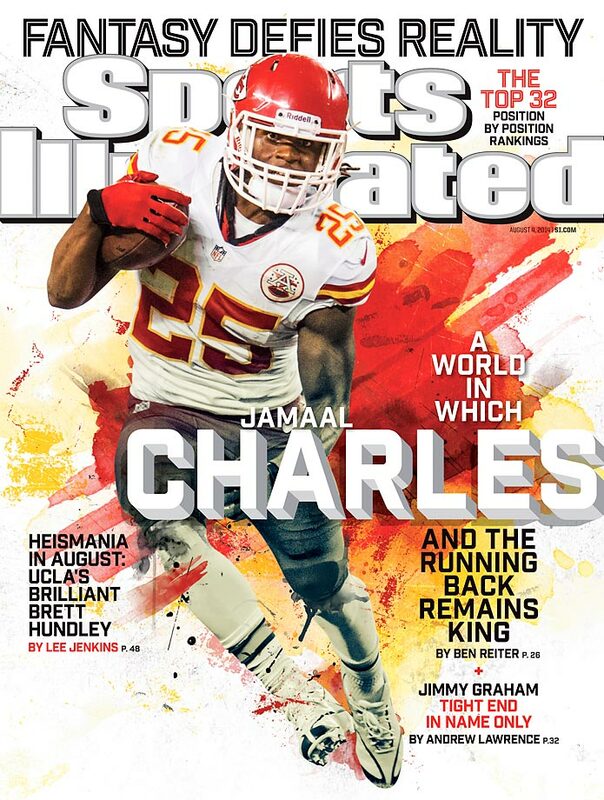 August 4, 2014 | Jamaal Charles, SI’s No. 1 fantasy running back, accounted for 35 percent of the Kansas City Chiefs offense, while leading the team in rushing and receiving. August 4, 2014 | The NFL’s offensive rookie of the year looks to improve on an 1,100 yard rushing season. 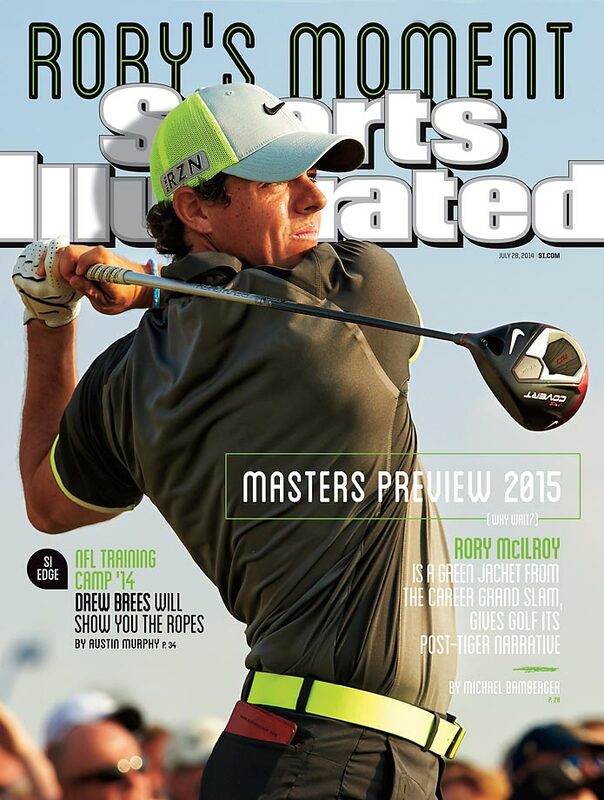 July 28, 2014 | Rory McIlroy keeps things in perspective as he is shooting to complete the career Grand Slam at next year’s Masters. 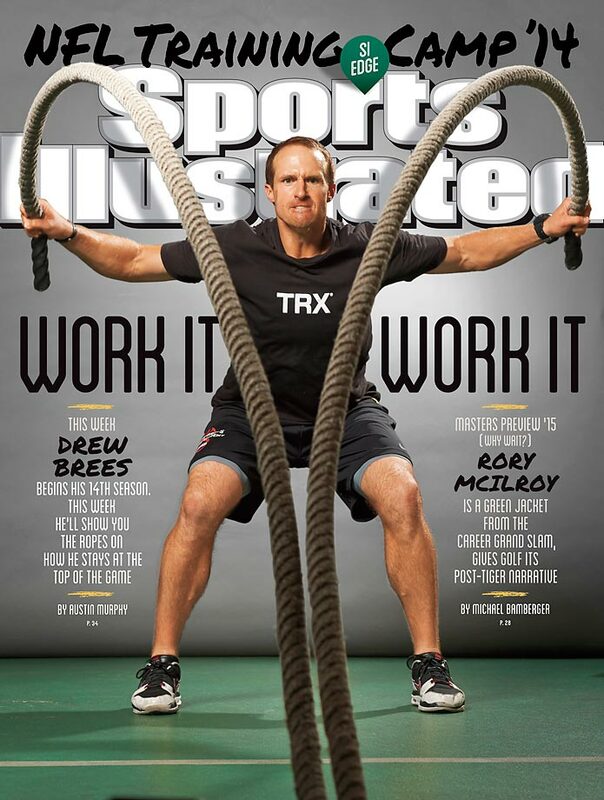 July 28, 2014 | As Saints quarterback Drew Brees enters his 14th NFL season, he relies on flexibility, core stability and rotational strength to keep in shape. 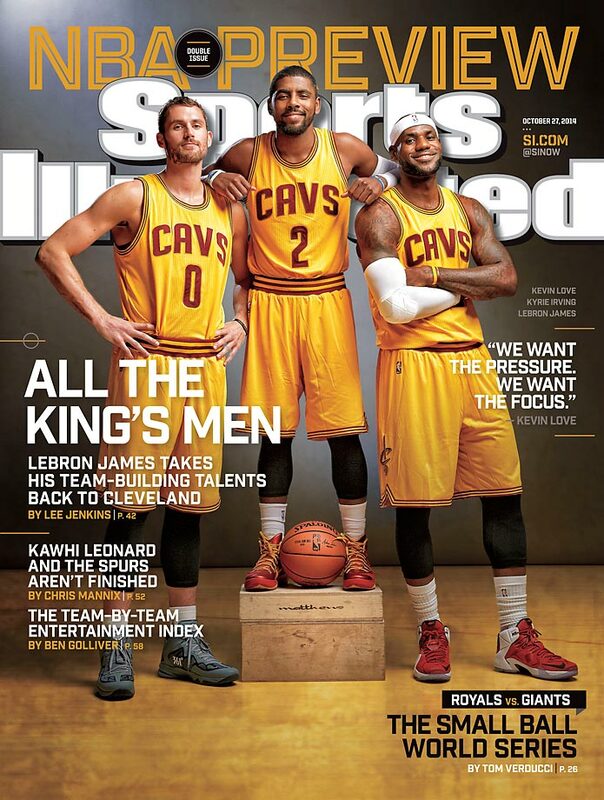 July 21, 2014 | Cleveland has reason to believe again after LeBron James decided to rejoin the Cavaliers. 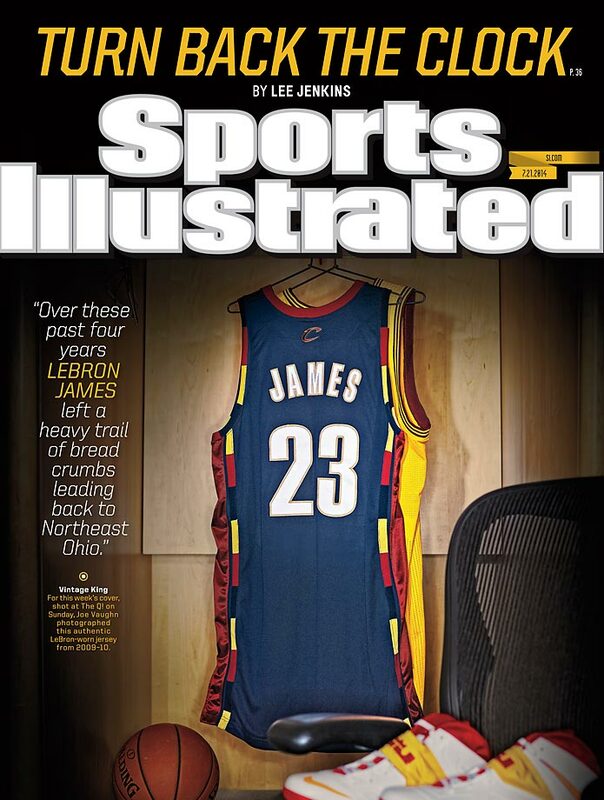 SI takes a closer look at how James' return came together and what it means for Northern Ohio. July 7-14 | When you think of the Chicago Cubs, the first name that usually comes to mind is Ernie Banks. 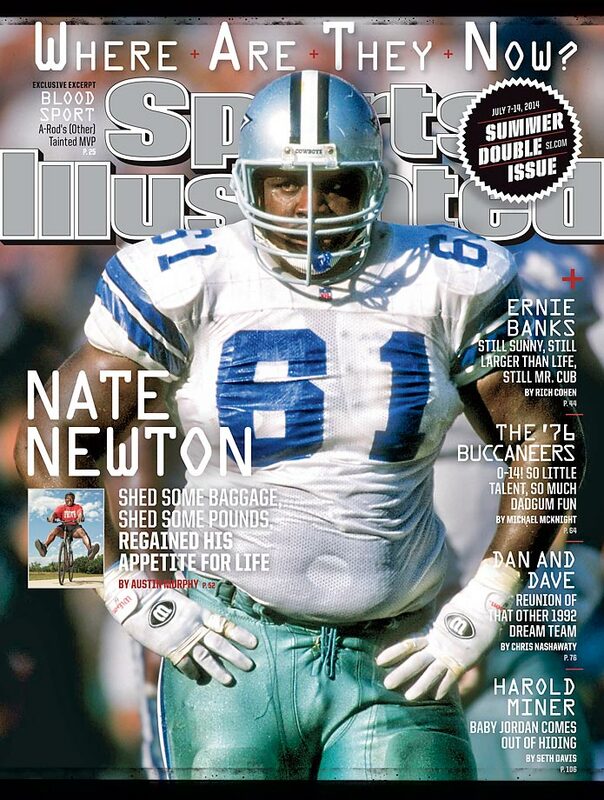 Banks, along with former Dallas Cowboys offensive lineman Nate Newton, are featured in SI's "Where are they now?" double issue. 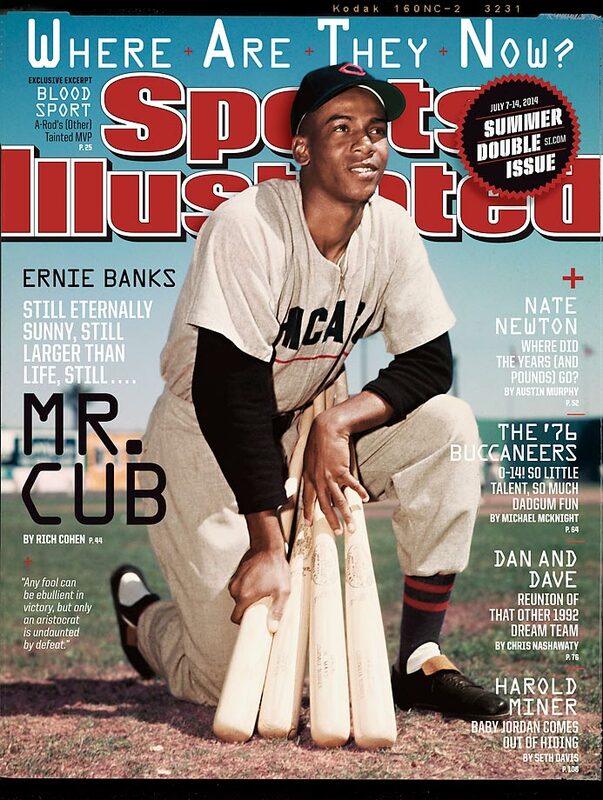 In the issue, Banks explains why the Cubs haven't won a World Series since 1908. "First of all, Wrigley Field. It's a different place to play," Banks tells SI's Rich Cohen. "I mean, the wind blows all kinds of ways. Foul lines are very close to the wall." July 7-14 | Nate Newton and his fellow Dallas Cowboys linemen helped running back Emmitt Smith win four rushing titles. 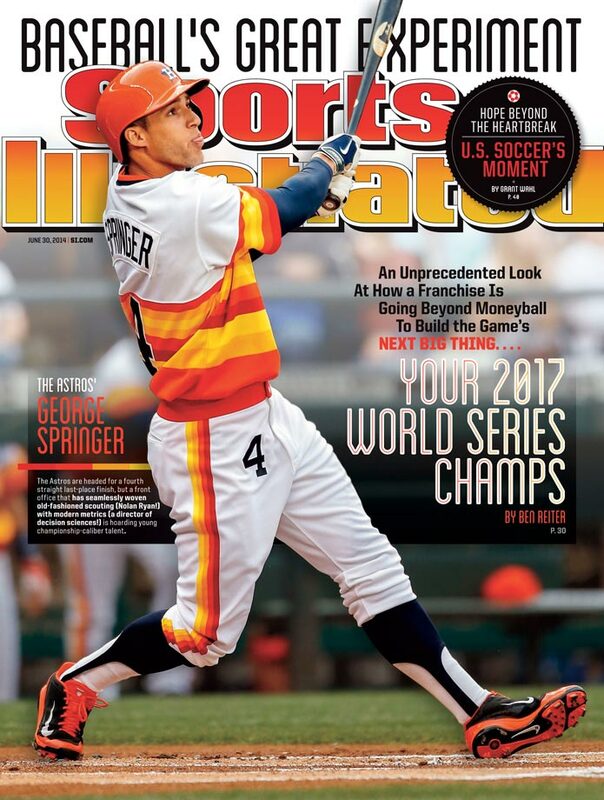 June 30, 2014 | This week's Sports Illustrated cover features Houston Astros rookie right fielder George Springer, who is trying to help the team climb out of baseball's cellar. Springer, who has 14 home runs and 39 RBI in only 59 games this season, along with major league hits leader Jose Altuve, still have some work to do as Houston sits at 33-45, good for last place in the American League West as of June 25. Check out the Sports Illustrated print edition this week (subscribe here) for SI.com writer Ben Reiter’s piece on how scouting and modern-day metrics are potentially building the Astros toward championship contention in the future. June 23, 2014 | Chuck Noll, the coach behind the Pittsburgh Steelers' famed "Steel Curtain" defense, was undoubtedly one of the greatest coaches ever to man an NFL sideline. In 23 seasons, Noll compiled a 209-156-1 record, but the Hall of Fame coach will be remembered most for leading the Steelers to four Super Bowl victories in six years. Noll died in his sleep at his Pittsburgh-area home last week at the age of 82. 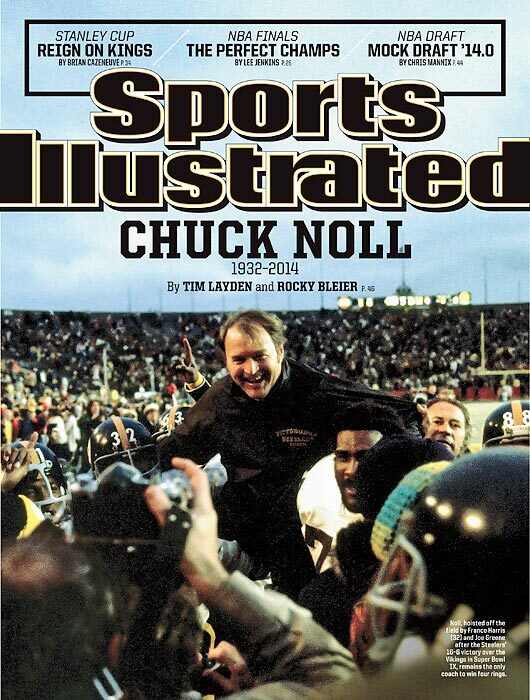 This week's Sports Illustrated features remembrances from SI senior writer Tim Layden and former Pittsburgh running back Rocky Bleier, who anchored the backfield of those championship Steeler teams. 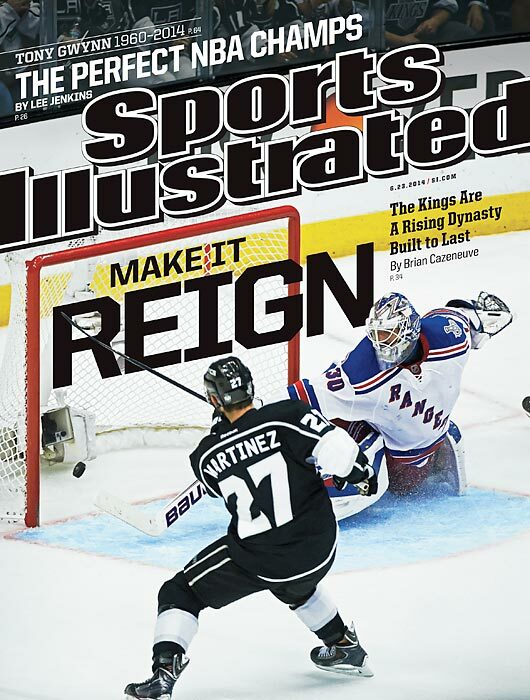 June 23, 2014 | The goal by defenseman Alec Martinez at 14:43 of double overtime in Game 5 of the Stanley Cup Final capped one of the most remarkable championship runs in NHL history. En route to winning their second Cup since 2012, the gritty, resilient Los Angeles Kings became the league's first team to win three Game 7s on the road during the same postseason, and the first to play as many as 26 games before securing the coveted chalice. They also survived seven playoff games in which they could have been eliminated, and rallied from two-goal deficits four times, including the first two matches of their final series against the New York Rangers. In this week's issue of Sports Illustrated, Brian Cazeneuve explores how General Manager Dean Lombardi has built a model franchise and budding dynasty with a shrewd philosophy. June 23, 2014 | San Antonio demolished Miami so quickly in the NBA Finals that it required real effort to catalog all of the ways the Spurs had distinguished themselves from their previous title teams, from past NBA champions, and from the other 29 teams that competed for a title this season. Boiling down the Spurs' standout characteristics into a laundry list of adjectives might look something like this: dominant, international, systematic, deep, explosive, fluid, unselfish, balanced, disciplined, focused, redemptive and fun. 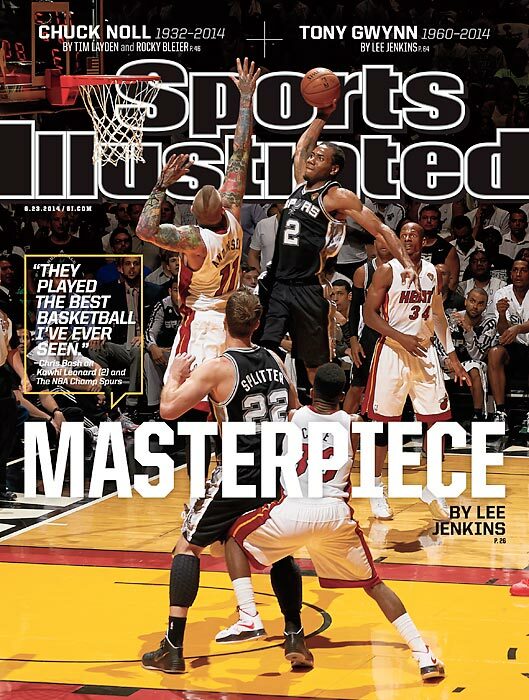 In a cover story for the June 23 issue of Sports Illustrated, Lee Jenkins touches on many of these attributes as he traces San Antonio's return from a devastating 2013 Finals loss to Miami. 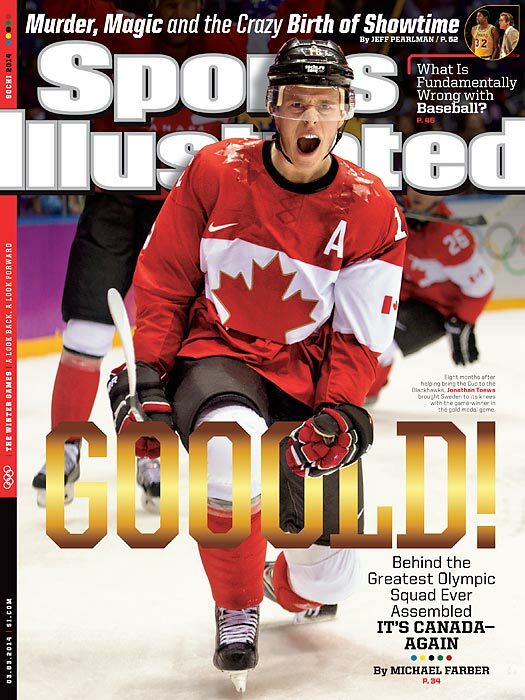 June 16, 2014 | The cover of Sports Illustrated this week announces the NHL's return to that most coveted of all states: hotness. The league has reached this scorching status for, presumably, the first time since 1994, when the cover on which this week's issue riffs ? 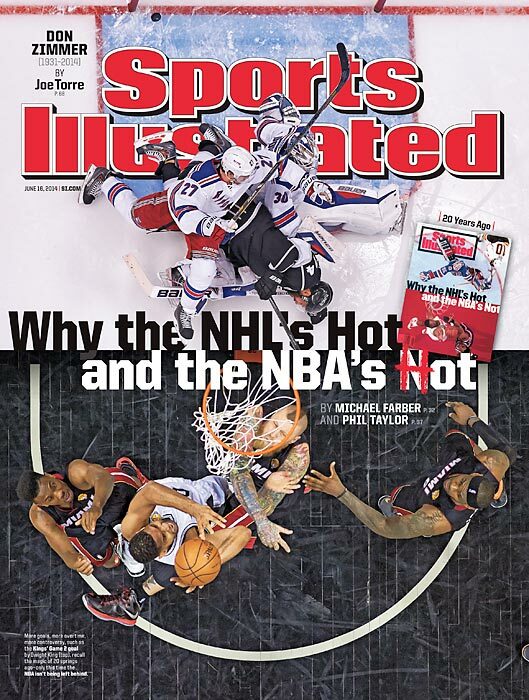 WHY THE NHL'S HOT AND THE NBA'S NOT ? 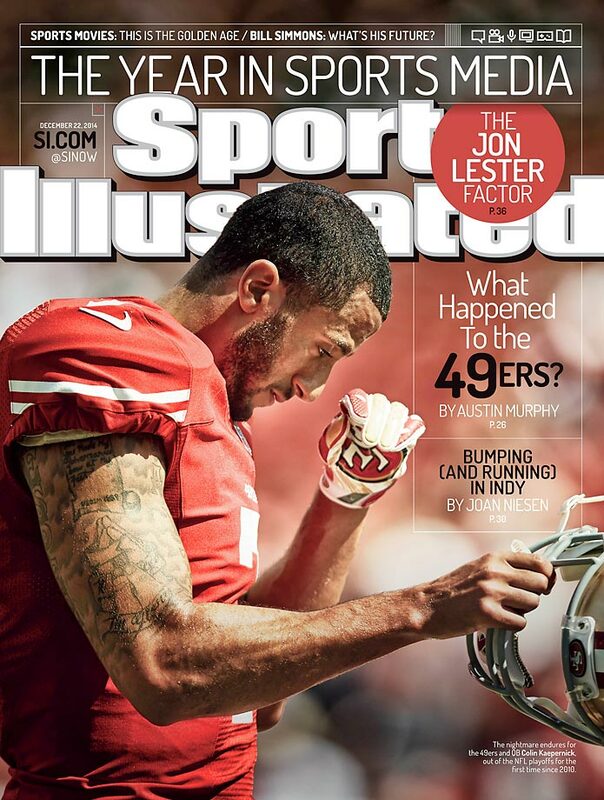 originally ran as an SI cover. 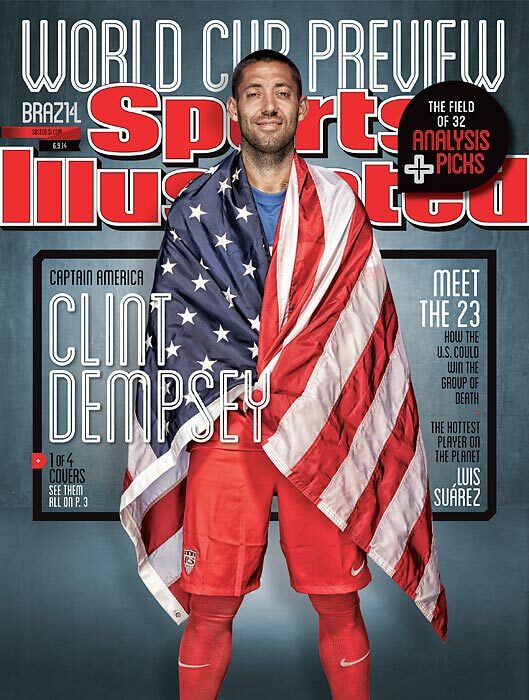 June 9, 2014 | There is no small effort involved in getting the three best soccer players in the world (Lionel Messi, Cristiano Ronaldo and Luis Suárez) and the captain of the U.S. national team (Clint Dempsey) on the cover of Sports Illustrated magazine in the same week. 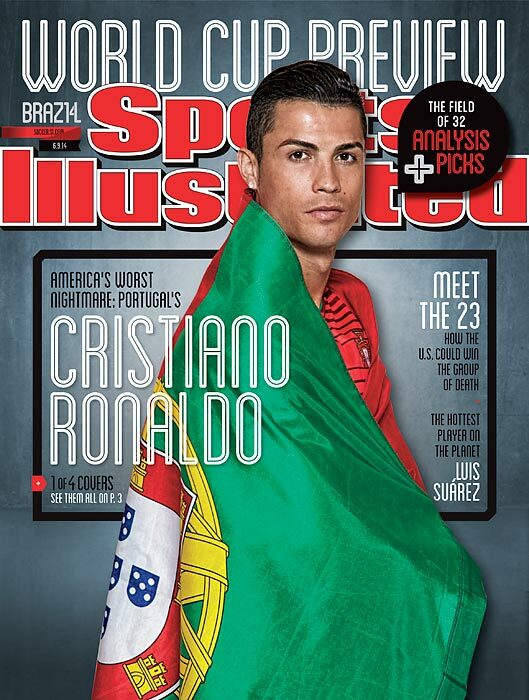 But that's exactly what SI did for our World Cup 2014 preview issue, which features four different covers, all of which are mixed evenly in the distribution of magazines to subscribers and newsstands this week. 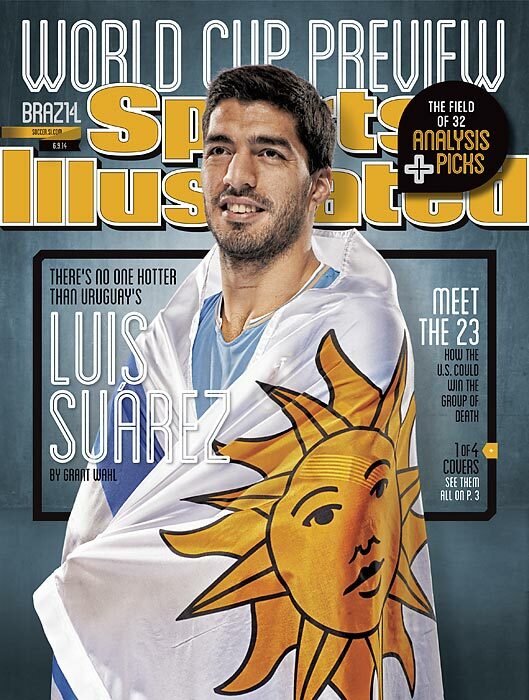 It's a historic moment for soccer in SI, the 19th time the sport has appeared on the cover of the magazine since it started being published weekly in 1954. 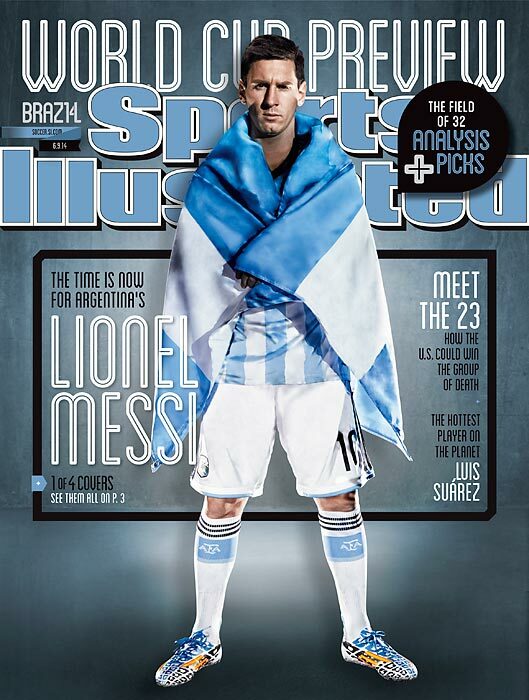 Messi, Ronaldo and Suárez are making their first appearances on the cover, while Dempsey is on the front for the second time. June 2, 2014 | From out of the shadow of tragedy, the Rangers have gone on a stirring playoff run that has fueled the passion of their devoted fans, summoned memories of the team's epic journey to the Stanley Cup in 1994 and become one of the most compelling stories of the NHL's postseason. 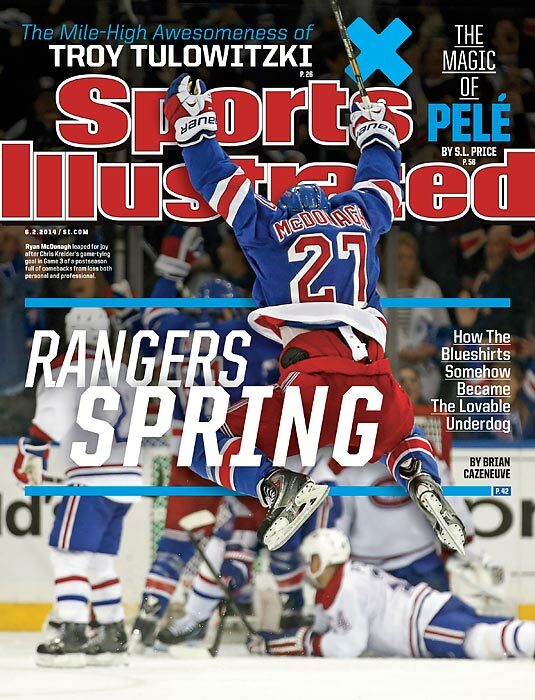 In this week's issue of Sports Illustrated, Brian Cazeneuve examines how the Broadway Blueshirts, with new coach Alain Vigneault and a mix of veteran stars and homegrown talent, have shed decades of mediocrity. 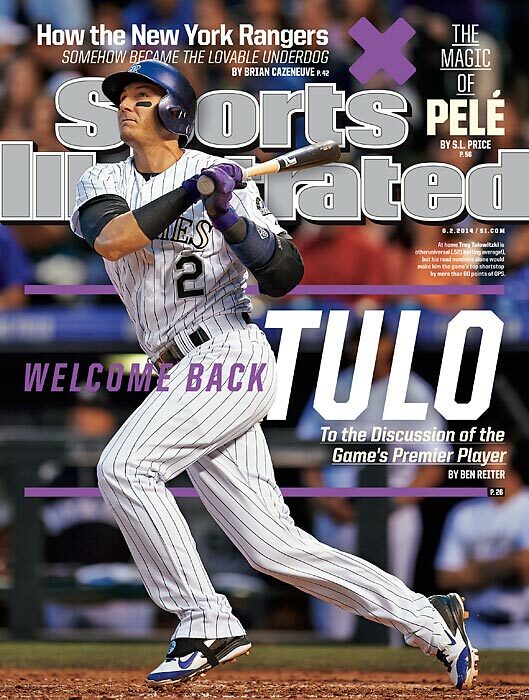 June 2, 2014 | Troy Tulowitzki has been the best player in baseball through the first two months of the season, and that hot start has landed him a regional cover of Sports Illustrated. In this week's issue, staff writer Ben Reiter profiles the early National League MVP favorite, who has been tattooing the ball all season, especially in the friendly confines of Coors Field. 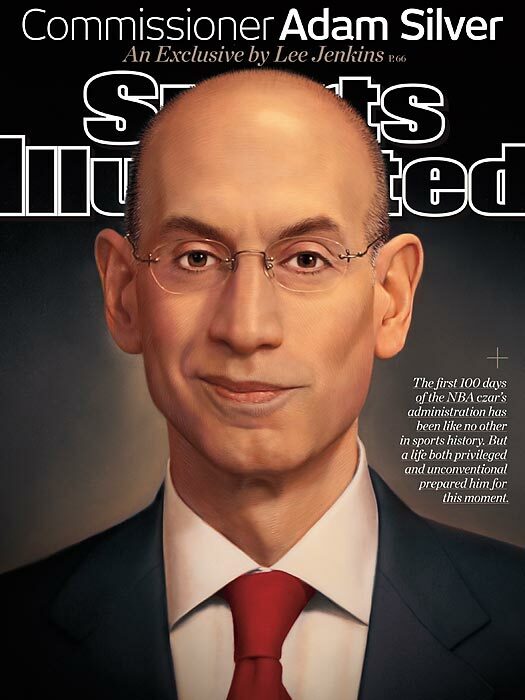 May 26, 2014 | The first 100 days of new NBA commissioner Adam Silver's administration has been like no other in sports history. 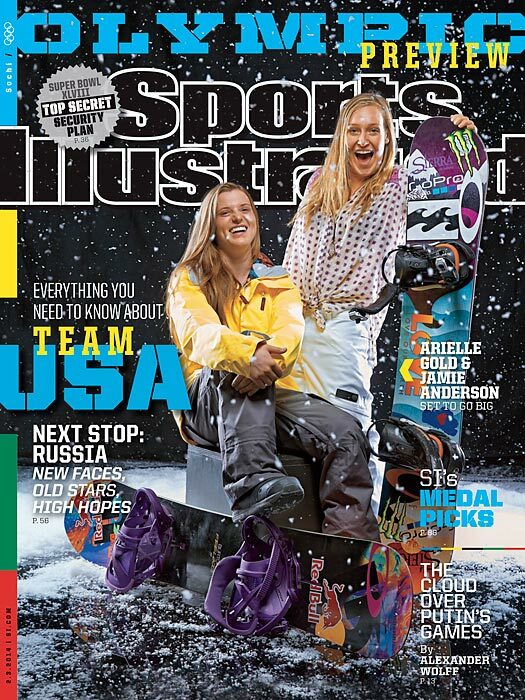 In this week's SI cover story, staff writer Lee Jenkins explains how a life both privileged and unconventional prepared Silver for this moment. 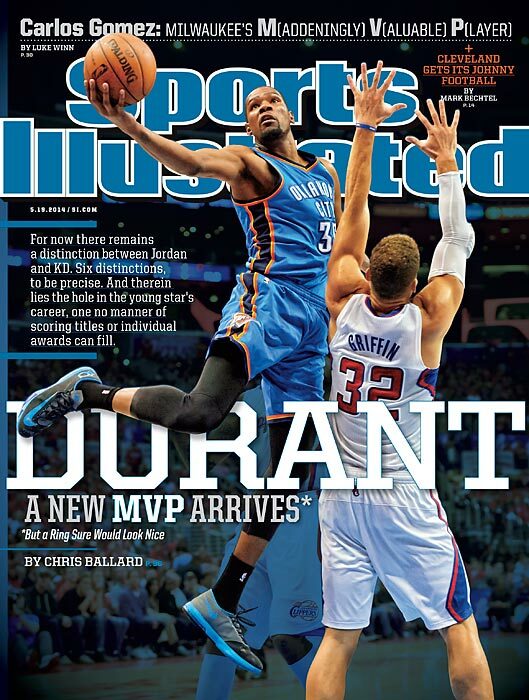 May 19, 2014 | After winning the NBA's Most Valuable Player award for the first time in his career, Oklahoma City Thunder star Kevin Durant appears on the cover of this week's Sports Illustrated. In the Sports Illustrated cover story, Durant is profiled by SI's Chris Ballard, who examines the Thunder star's quest for the only missing piece of hardware in his trophy case: an NBA title. 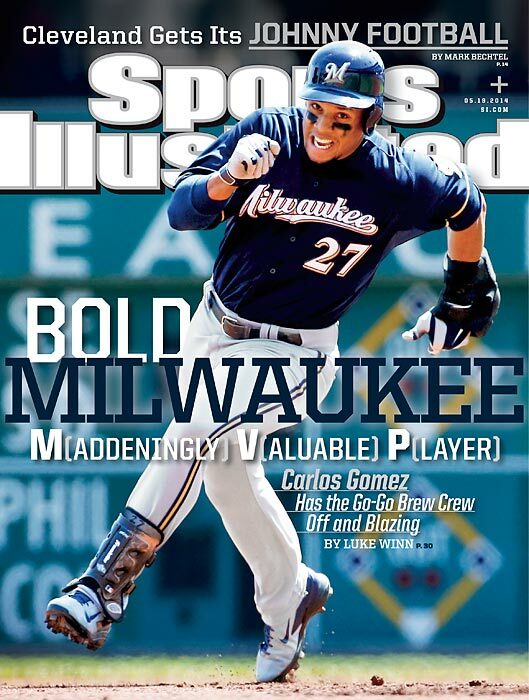 May 19, 2014 | Flamboyant, outspoken and one of baseball's best players: Carlos Gomez has raised a lot of attention as the table-setter for the Brewers, and his rise from former top prospect to MVP candidate has him gracing one of the regional covers of the May 19 issue of Sports Illustrated. 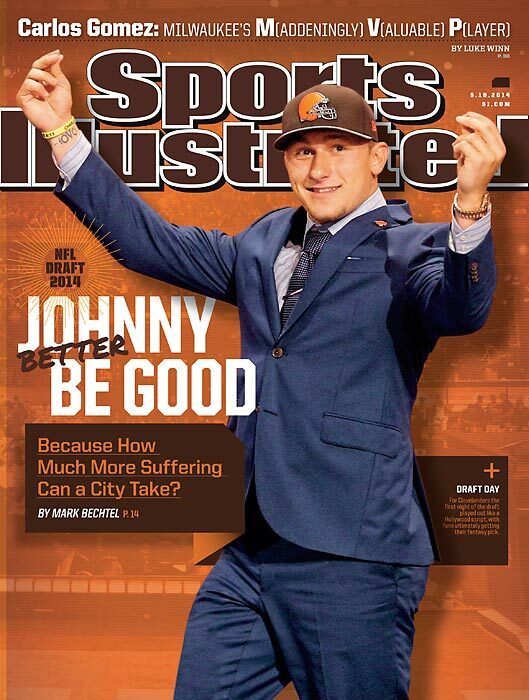 May 19, 2014 | Some went wild when the Cleveland Browns selected Johnny Manziel at No. 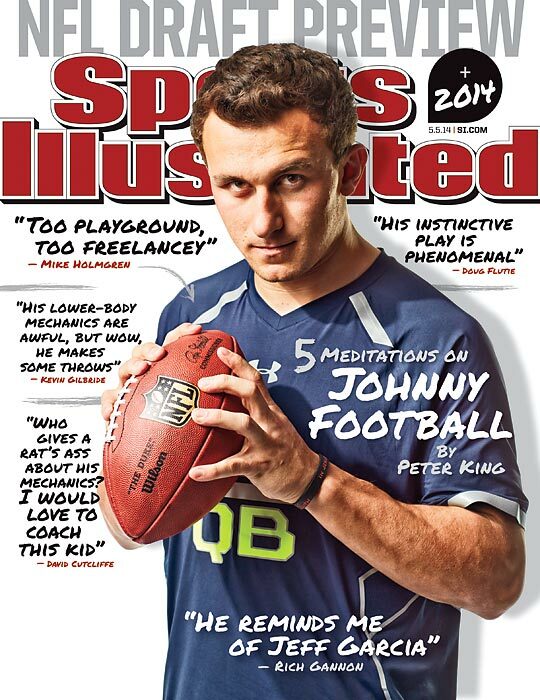 22 overall, but many Clevelanders remain wary of Johnny Football. 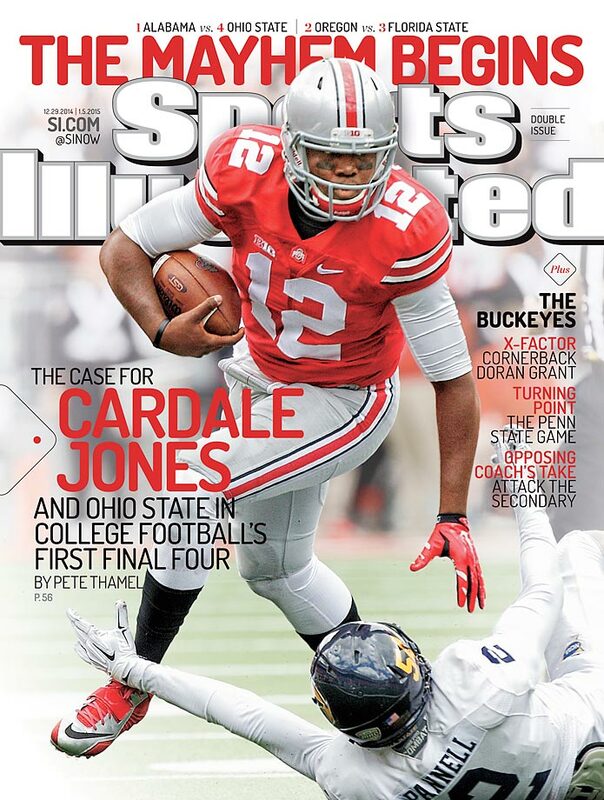 Mark Bechtel details that tension in this week's issue of Sports Illustrated. 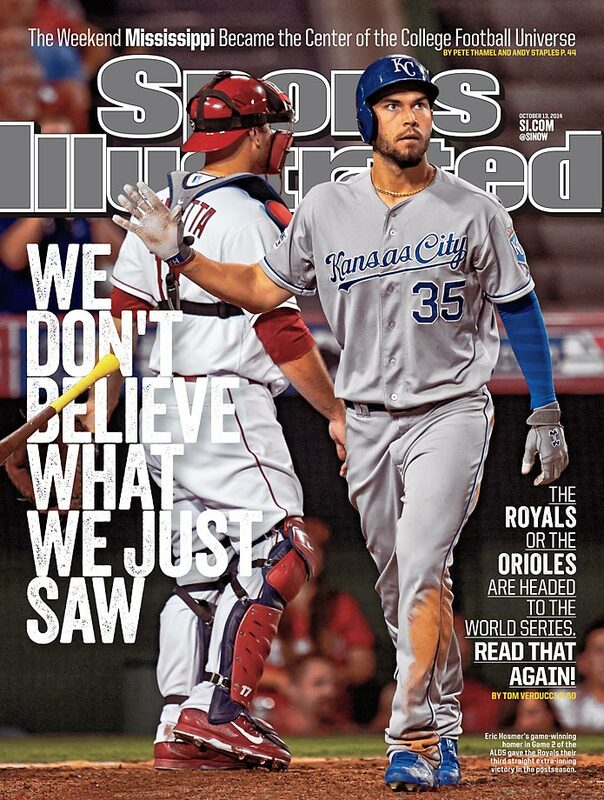 May 12, 2014 | Baseball's best player now has his own national Sports Illustrated cover. This week's issue features Mike Trout, the Angels' superstar and the best young player in the game, as he pushes forward with a career that has already been historically great. 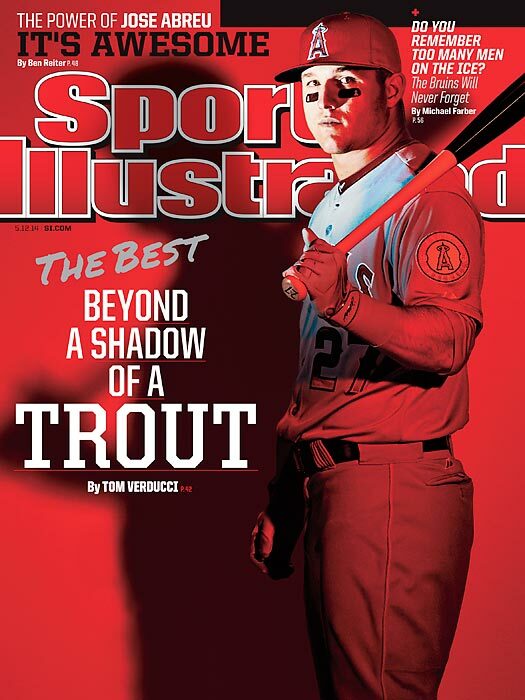 Along the way, SI senior writer Tom Verducci tries to answer the question of just how good Trout can be. 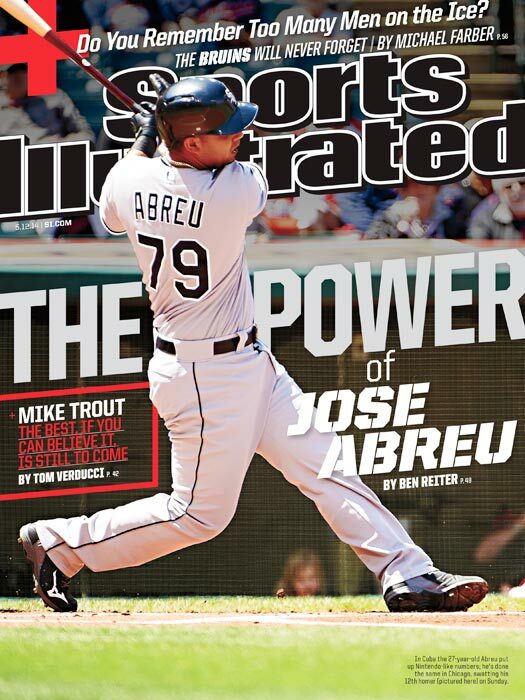 May 12, 2014 | Jose Abreu, whose power has already made him a force to be reckoned with in the majors, landed SI's regional cover this week. 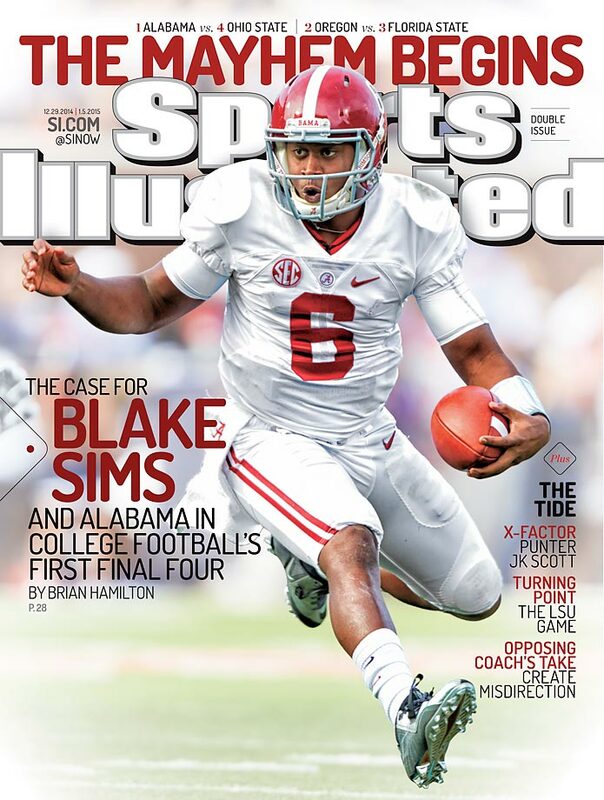 May 5, 2014 | The most polarizing figure in the 2014 NFL draft graces the cover of Sports Illustrated's NFL draft preview issue. Former Texas A&M quarterback Johnny Manziel has been called everything from a future All-Pro to a bust waiting to happen. What's the reality? TheMMQB's Peter King sat down with five of the best quarterback evaluators in the business to get a definitive read on Johnny Football. April 28, 2014 | Why would a man turn down $144 million? 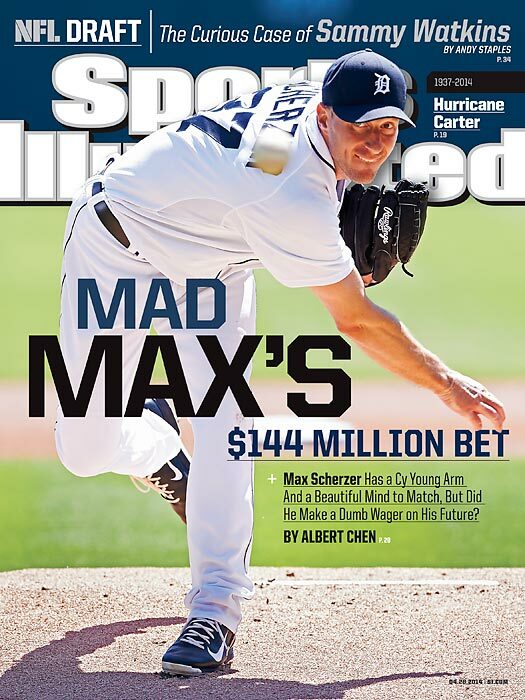 In this week's cover story, that's the question Albert Chen asked Max Scherzer, who rejected a lucrative extension offer from the Detroit Tigers. On Monday night, the UConn Huskies defeated the Kentucky Wildcats 60-54 to win the school's fourth national championship. It was the end of a remarkable and improbable run for the Huskies, which were a No. 7 seed coming into the NCAA tournament and had to defeat the Nos. 2 (Villanova), 3 (Iowa State) and 4 (Michigan State) seeds in the East regional. In the national semifinal, they defeated the No. 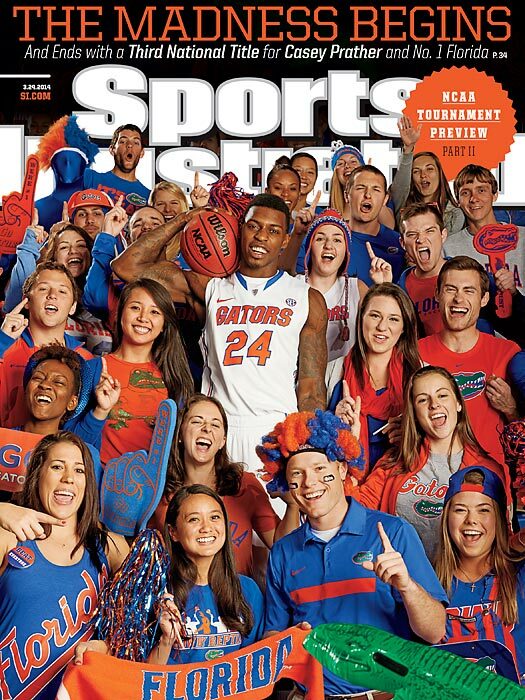 1 overall seed in the tournament, the Florida Gators, before taking down the Gators' SEC rivals for the title. 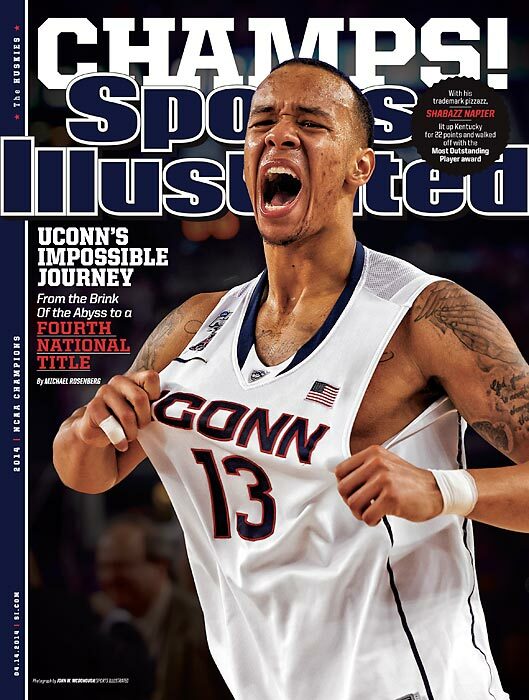 Shabazz Napier, who was named the tournament's Most Outstanding Player, averaged 26.2 points per game in the Huskies' six-game stretch. 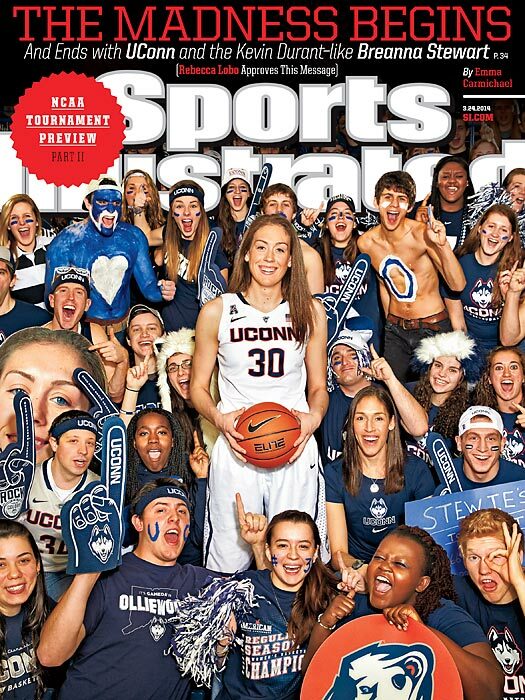 In the cover story, senior writer Michael Rosenberg describes UConn's journey "from the brink of the abyss to a fourth national title." 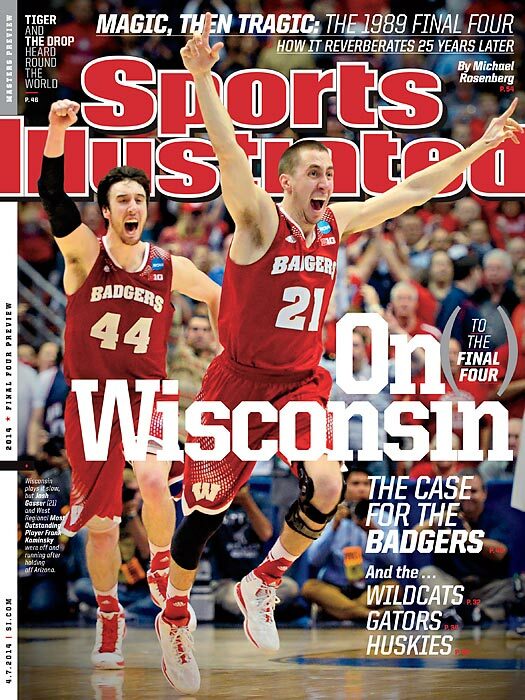 Kentucky and Wisconsin, winners of the Midwest and West regionals, respectively, each earned a cover of Sports Illustrated this week. In the Final Four previews, our writers make a case for each of the Final Four teams ? 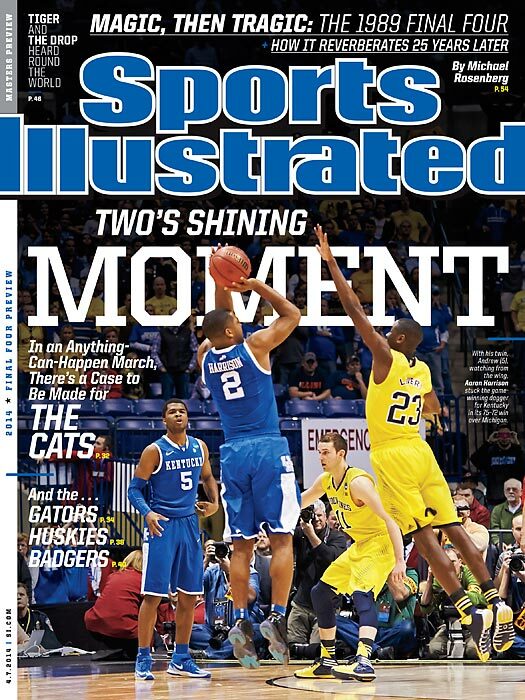 and take you inside Kentucky's incredible run to Dallas. 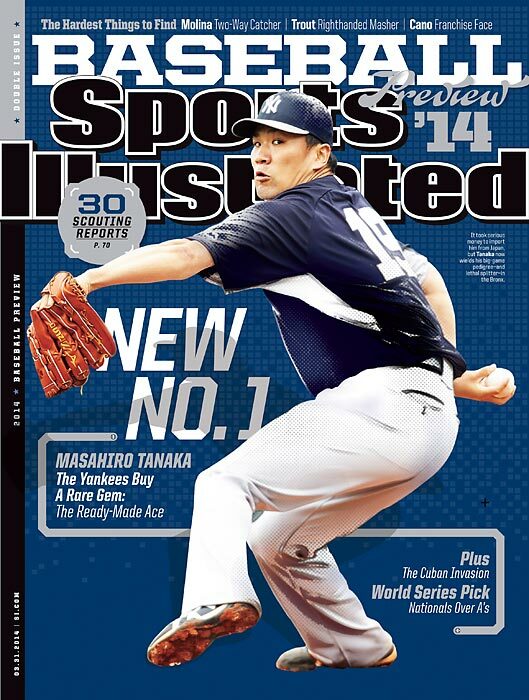 Sports Illustrated's 2014 MLB season preview is here, led by the newest Japanese star, Masahiro Tanaka. 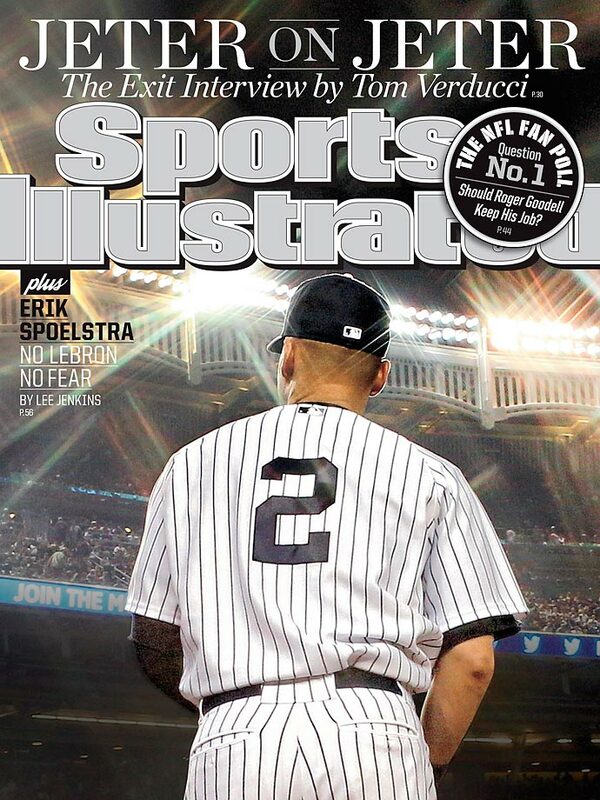 The Yankees' $175 million investment and former star in Japan's Nippon Professional Baseball is the national cover for SI¹s preview issue, which also features three additional regional covers. Angels superstar Mike Trout, new Mariners slugger Robinson Cano, and Cardinals stalwart Yadier Molina landed the other three covers. 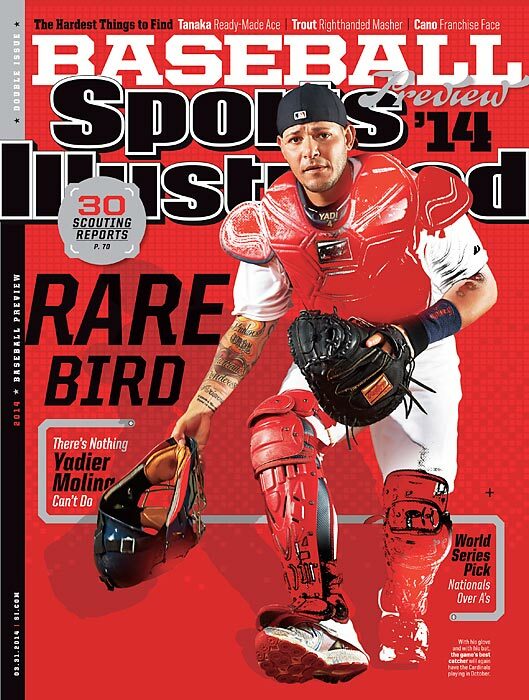 Sports Illustrated's 2014 MLB season preview is here, and Cardinals stalwart Yadier Molina graces one of the regional covers. 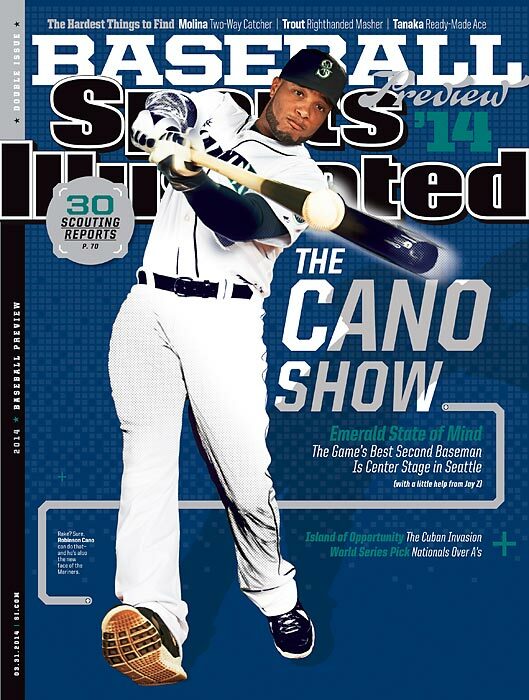 Sports Illustrated's 2014 MLB season preview is here, and Mariners slugger Robinson Cano graces one of the regional covers. 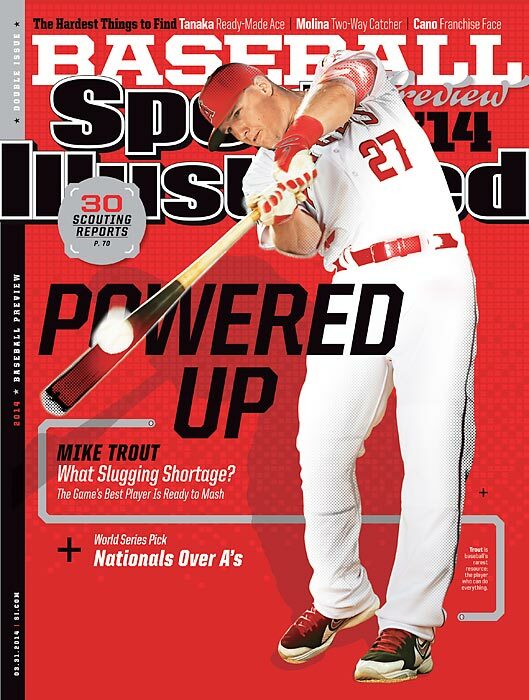 Sports Illustrated's 2014 MLB season preview is here, and Angels superstar Mike Trout graces one of the regional covers. The Gators have rattled off 26 straight wins, picking up an outright SEC championship along the way. The No. 1 overall seed looks strong heading into the NCAA tournament and will face favorable matchups in the South regional. 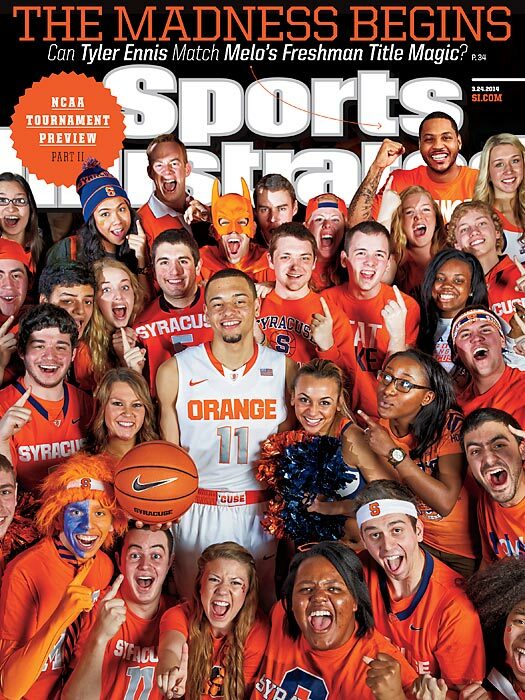 Syracuse struggled down the stretch, but don't forget about a team that started the season 25-0. Canadian import Tyler Ennis has proved his ability to make game-winning plays throughout the regular season and will be ready to do the same in the Big Dance. 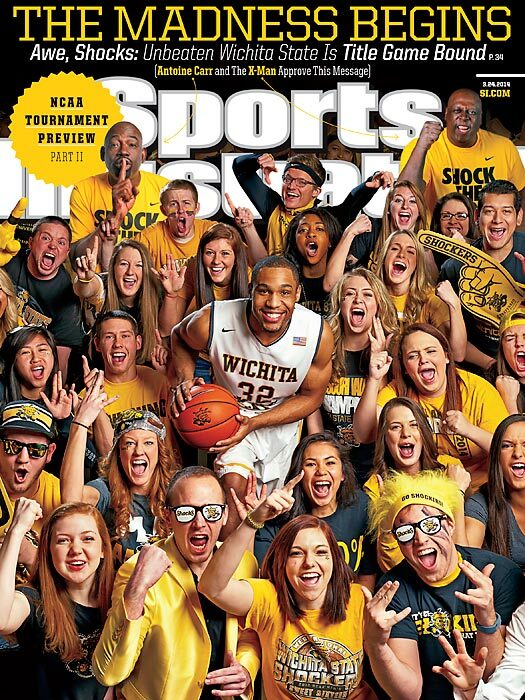 In the regular season, no team could stop the Shockers, as they finished 34-0. The Shockers face an incredibly difficult road to the Final Four in a Midwest region stacked with talent, and they're picking up doubters left and right -- but maybe that's just what they want. 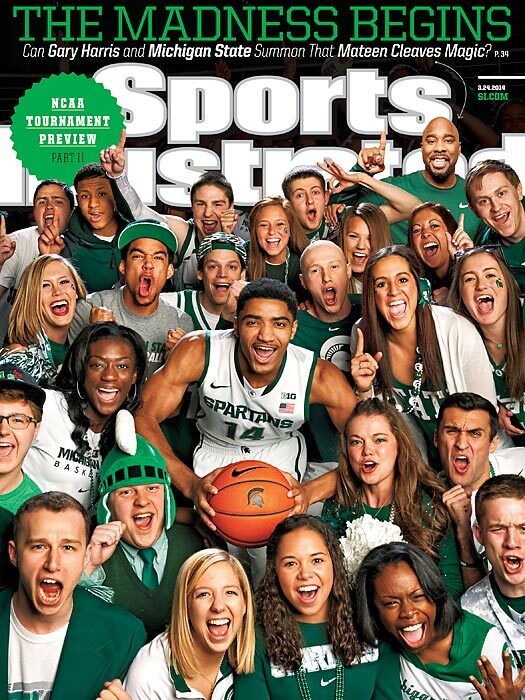 Gary Harris has been the go-to guy for the Spartans all season, and now he's got a fully healthy team behind him. Never bet against Tom Izzo in March. Arizona spent eight weeks at No. 1 before losing Brandon Ashley ? and some games. But now the Wildcats have rediscovered their mojo and are ready to make a run in the tournament. The defending national champion UConn Huskies enter the tournament with a perfect 34-0 record, and hope to finish it off with the fifth perfect season in school history and a record ninth women's NCAA title. 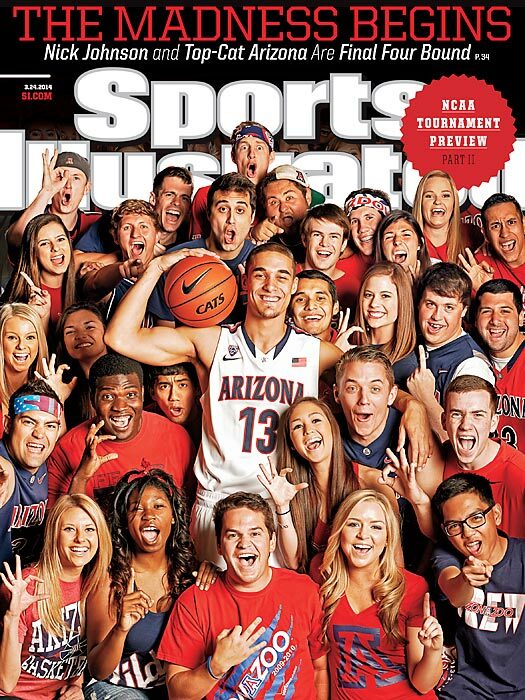 This week's Sports Illustrated cover is a trip back in time. Pete Rose, the all-time MLB hits leader and one of the most polarizing figures in the sport's history, graces the cover of the March 10 issue. The reason for Charlie Hustle's stint on the cover? 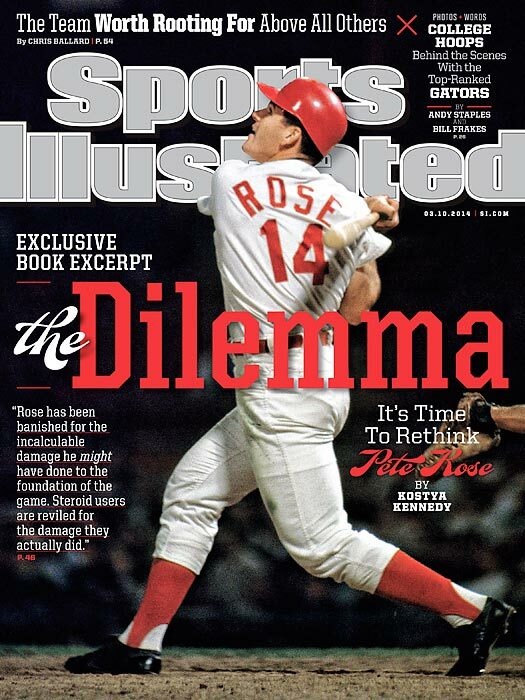 The upcoming release of Kostya Kennedy's Rose biography, "Pete Rose: An American Dilemma." In his book, Kennedy provides a detailed look back at Rose's life, as well as a portrait of the Hit King in retirement, and re-evaluates Rose's lifetime ban from baseball for gambling. 18-year-old Mikaela Shiffrin overcame her nerves and escaped a near-fall to win gold in the Olympic slalom, becoming the first U.S. women's slalom medalist since 1972 and the youngest Olympic slalom gold medalist. 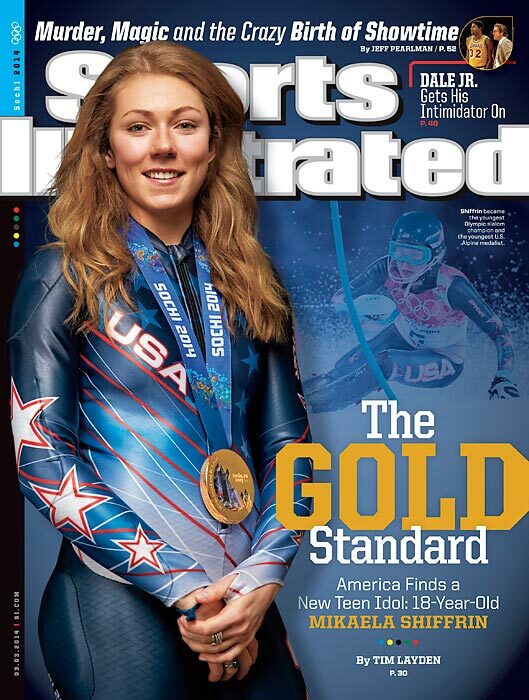 With her youth, Shiffrin is poised to become the face of Team USA for future Winter Olympics. 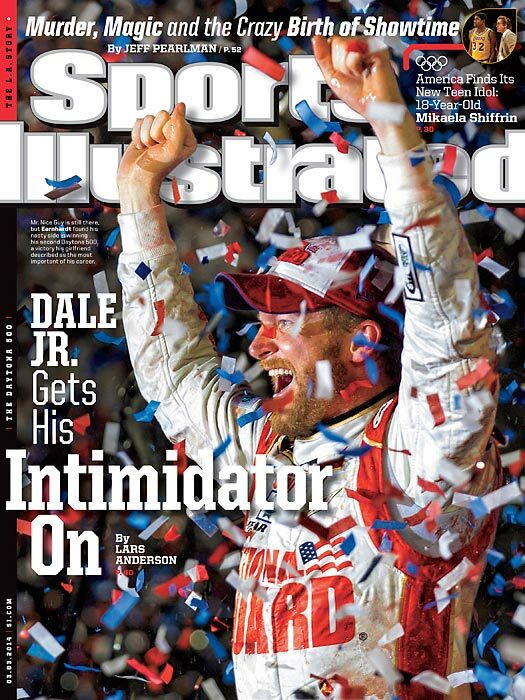 For the first time in a decade, NASCAR's favorite son finished on top of its signature race as Dale Earnhardt Jr. took the checkered flag in the Daytona 500. The victory offered hope of better times for the ever-popular Earnhardt, who won just his third race since 2006. Earnhardt's second win in the Daytona 500 gave him one more than his dad. For the third time in the five Olympics since NHL players began participating, Canada claimed the gold medal in men's hockey. The Canadians dominated the competition, eliminating the U.S. in the semifinals before blanking Sweden 3-0 in the gold-medal game, including a goal from Jonathan Toews. With the NHL refusing to commit to future Olympics, this could be the last truly insurmountable Olympic hockey championship squad. 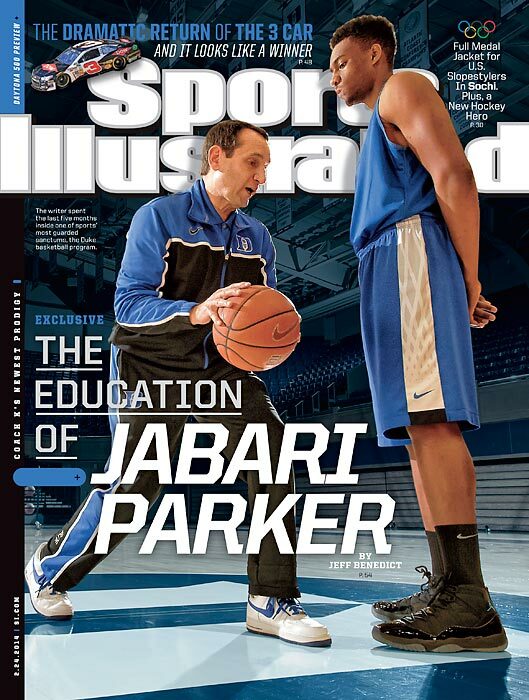 Freshman phenom Jabari Parker chose to attend Duke despite having interest from schools closer to home. In his intimate profile, Jeff Benedict explains Parker's decision and describes his tight-knit relationship with coach Mike Krzyzewski. 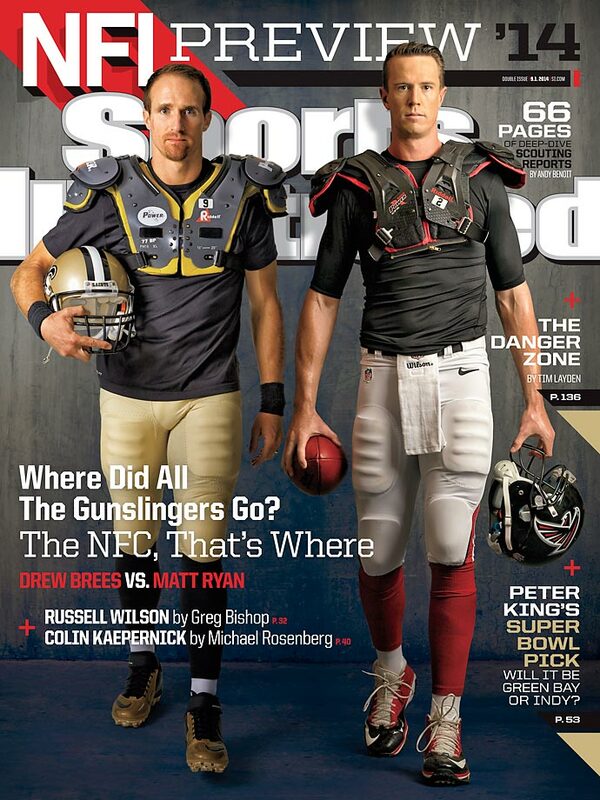 The two appear together on one of Sports Illustrated's regional covers this week. 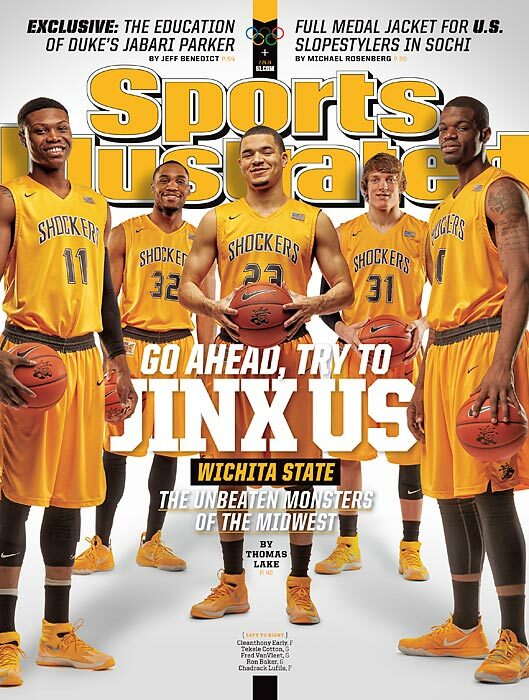 The Wichita State Shockers appear on the other regional cover. The Shockers, one of two remaining undefeated teams in Division I (Syracuse is the other), face every opponent's best game after their Final Four run a year ago. 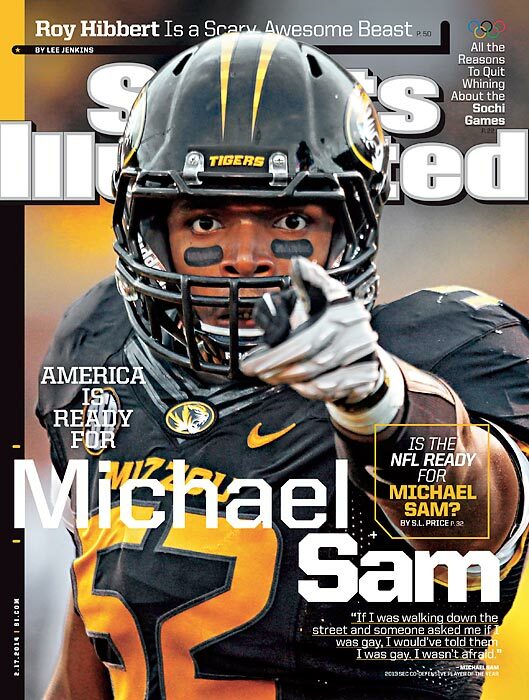 Defensive end Michael Sam wanted the NFL team that drafts him to have no doubts about his sexuality. Now he is poised to become the league's first openly gay player. His Missouri teammates accept him. Will the pros? 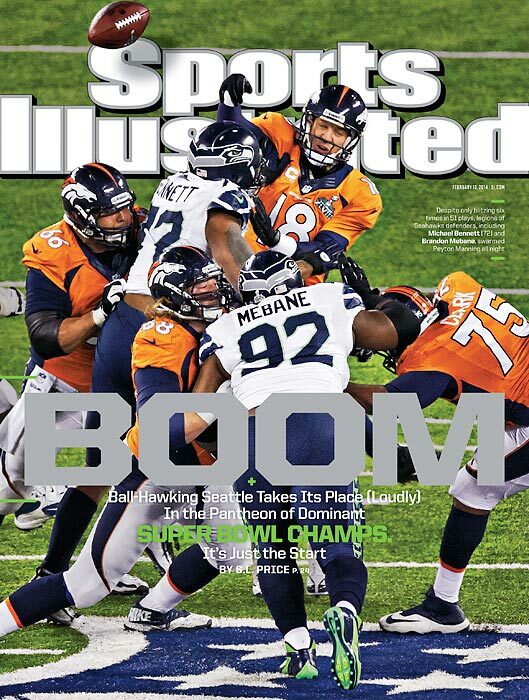 After dropping the boom on Peyton Manning and the Denver Broncos in Super Bowl XLVIII, Seattle Seahawks defenders Michael Bennett and Brandon Mebane appear on the cover of Sports Illustrated to commemorate Seattle's first NFL title. "This was Seattle's first championship since they joined the league as an expansion franchise in 1976," writes senior writer S.L. 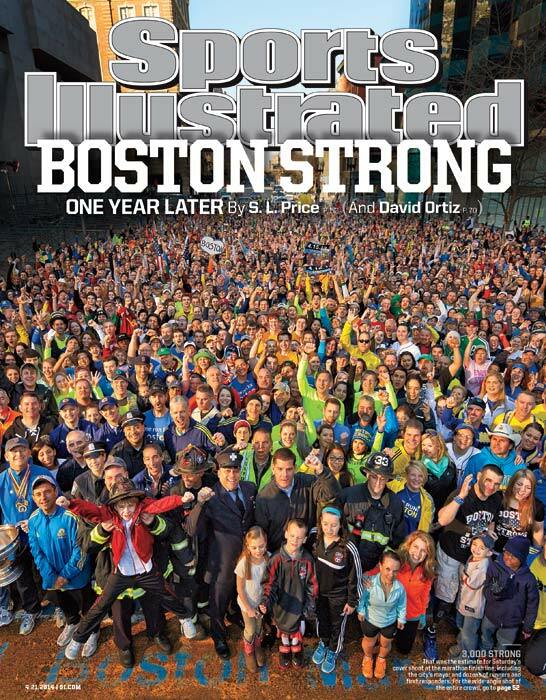 Price in this week's cover story. "Before their run to the Super Bowl in 2006 [an XL loss to the Steelers], they had gone a record 21 years without a playoff win, and until this season always seemed a step behind their rivals in San Francisco. But the unique identity created in 2010 by owner Paul Allen, GM John Schneider and coach Pete Carroll ? brainy, upbeat and tough -- proved perfect for transforming unheralded talent into a smart and singularly fierce outfit." 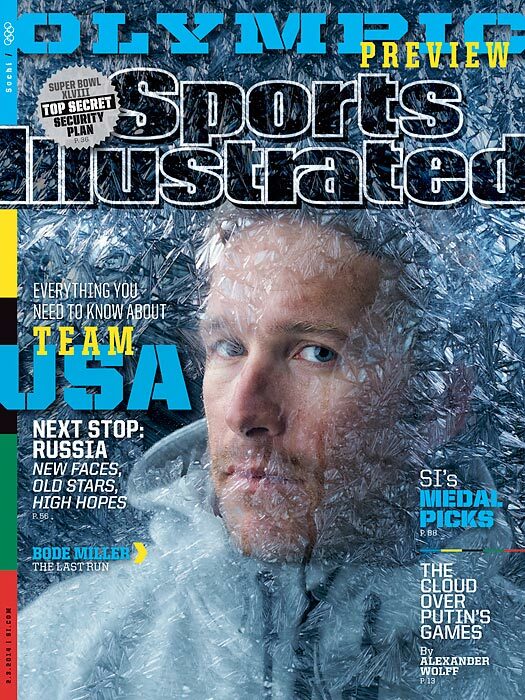 For the first time ever, Sports Illustrated has four Olympic Preview covers. 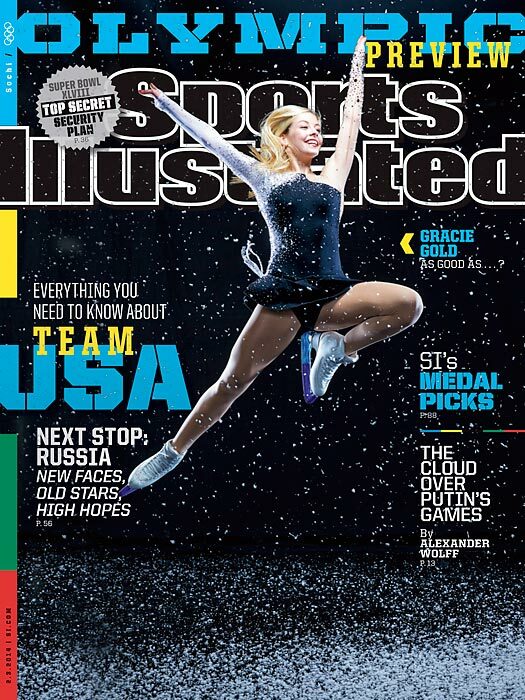 U.S women's Alpine skier Mikaela Shriffin, U.S. figure skater Gracie Gold, U.S. men's Alpine skier Bode Miller and U.S. snowboarders Jamie Anderson and Arielle Gold all appear on this week's covers. Each athlete brings his or her own unique story to the Olympics and gives viewers a reason to stay tuned throughout the upcoming games. 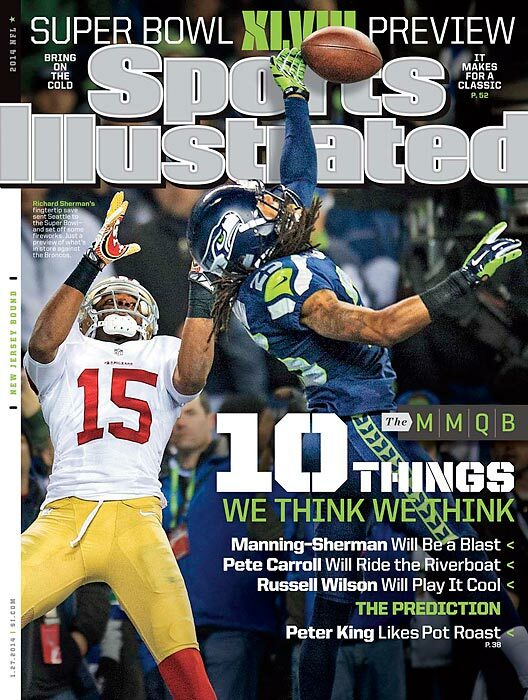 Richard Sherman, the talk of the NFL since the NFC title game, appears on one of Sports Illustrated's national covers this week. 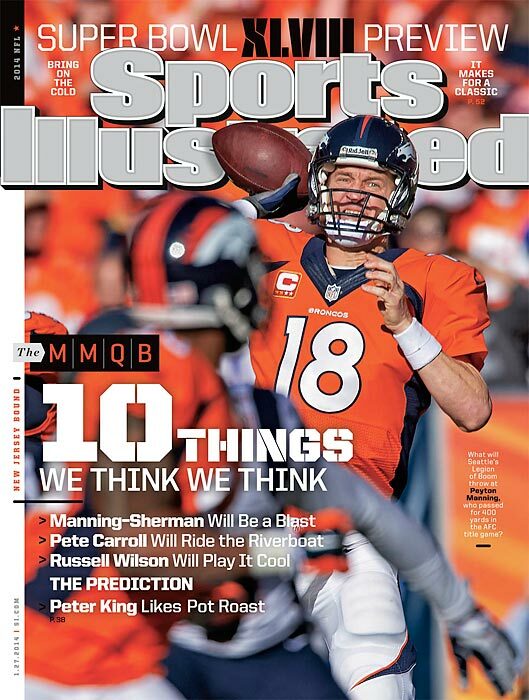 In advance of Super Bowl XLVIII, Peyton Manning and the Broncos appear on one of Sports Illustrated's national covers this week. 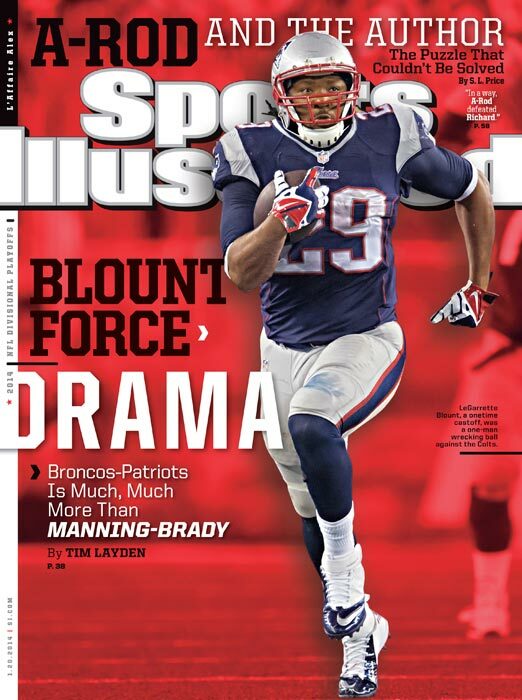 With Championship Sunday upon us, this week's issue of Sports Illustrated features the New England Patriots, Seattle Seahawks and Denver Broncos. January 13, 2014 | The SEC's reign of unchallenged dominance is over. Florida State brought that to an end with its 34-31 comeback victory over Auburn in the BCS National Championship Game on Monday night, placing the Seminoles back atop the college football world. 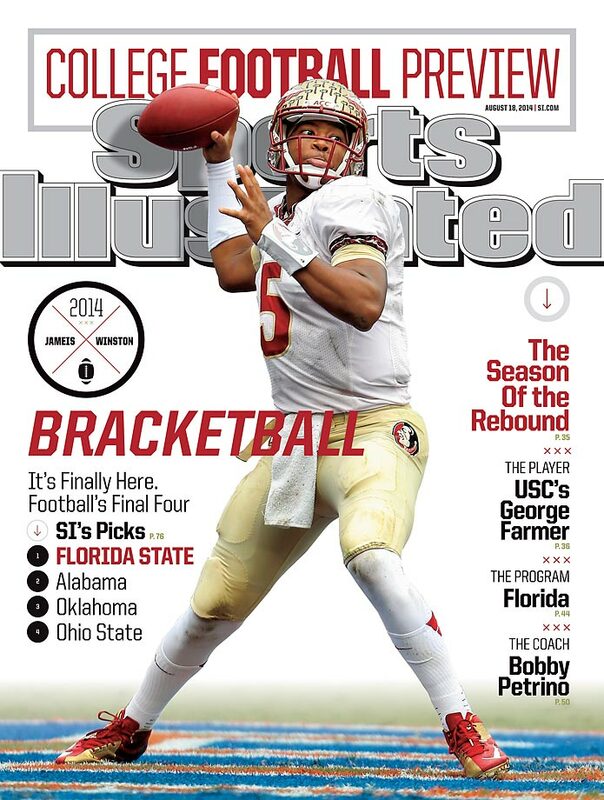 Fresh off the win, Florida State adorns the national cover of the Jan. 13 issue of Sports Illustrated. 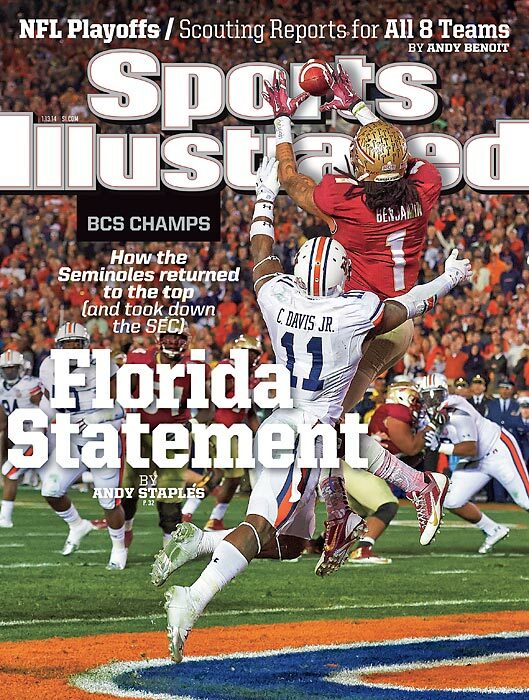 In the cover image, Seminoles wide receiver Kelvin Benjamin leaps into the air to snag the game-winning touchdown pass with 13 seconds remaining. Senior writer Andy Staples shares the story of the game from Pasadena, Calif. ? a dramatic, down-to-the-wire contest in which the Seminoles compiled the largest comeback in the 16-year history of the BCS title game ? and puts the monumental win in context. 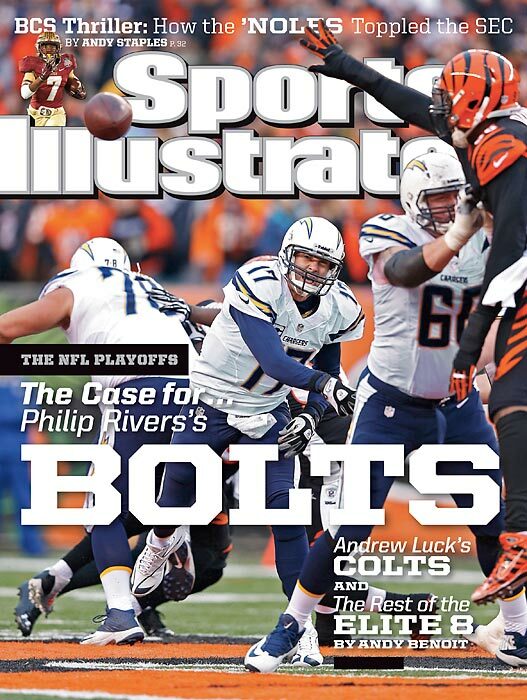 January 13, 2014 | Don't write off the San Diego Chargers as Super Bowl contenders, writes Andy Benoit in this week's issue of Sports Illustrated. Leading the Bolts' surge is Philip Rivers, who has experienced a renaissance under first-year coach Mike McCoy. January 13, 2014 | Moments before the Broncos kicked off against the Chiefs on Dec. 1, Denver Broncos RB Knowshon Moreno had a moment to remember. As the national anthem blasted from the stadium's speakers,tears streaked down Moreno's face. It prompted the question: What could bring a running back in the midst of a breakout year on one of the best teams in the NFL to tears? 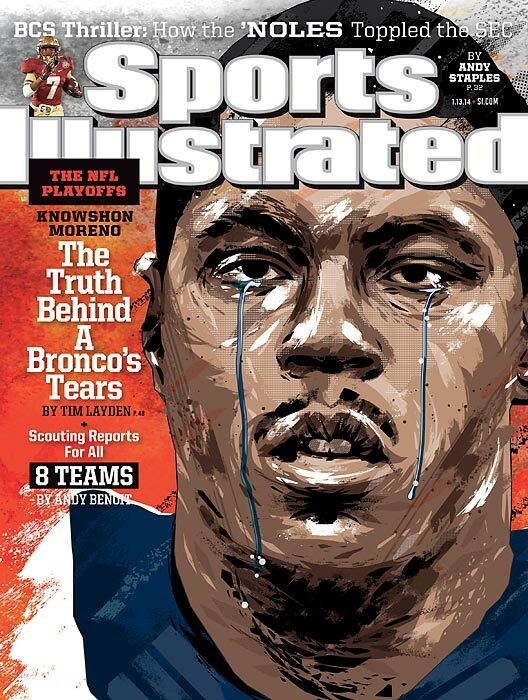 In this week's issue of Sports Illustrated, senior writer Tim Layden finds the truth behind Moreno's tears. 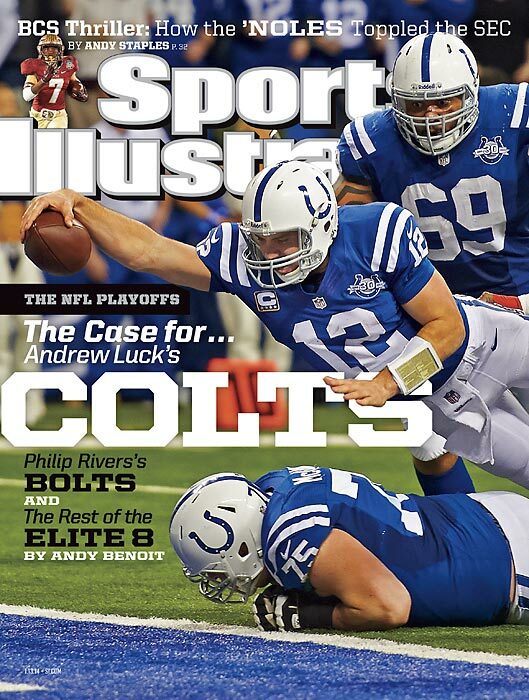 January 13, 2014 | Andrew Luck and the Indianapolis Colts playing in Super Bowl XLVIII in New York? 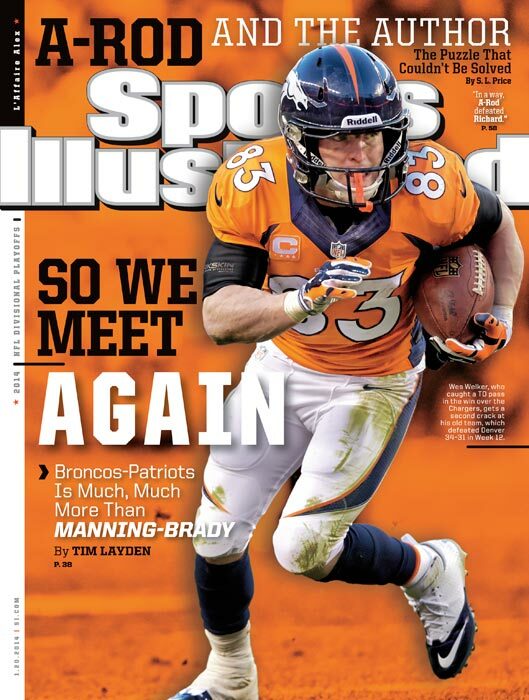 It could happen, says Andy Benoit in this week's issue of Sports Illustrated. Fresh off an improbable comeback over the Chiefs, the Colts are rolling ? and Luck is the reason why.